Since the last Report in November 2018, we have extended our membership by inviting Mr Stephen Povall to join our Group and Stephen has kindly accepted the invitation. 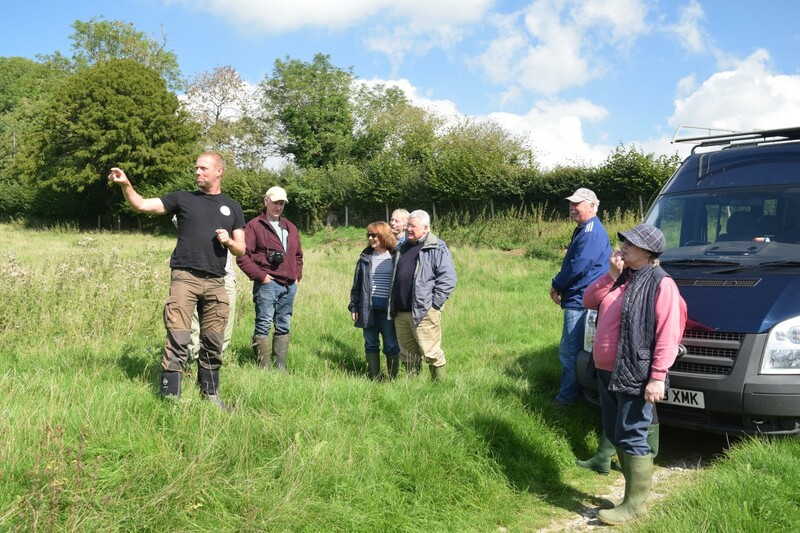 This step was taken in order to include the views of the local farming community in our Group as they are the owners and managers of the catchments on which our rain falls and their actions have a significant effect on flooding downstream. Taking this further, we have also had discussions with the local NFU Office in the person of Sarah Faulkner. Sarah represents the farming community on the Shropshire Slow The Flow Steering Group. The NFU have discussed Natural Flood Management (NFM) with the Shropshire Council and Shropshire Wildlife Trust (SWT) for some years and aim to ensure that such proposals can be delivered within the framework of the farming business. The NFU will be holding a Meeting in the Diddlebury Village Hall on May 16th at which these topics will be aired with members of the local farming community. Stephen has already kindly volunteered to allow the Small Woods Association (based in Ironbridge) and working with Birmingham University and Earthwatch to undertake a research project to investigate the value of coppice bundles (river faggots) for the prevention of soil erosion and nitrification of water courses, on his land. A proposed tree planting exercise arranged with the SWT in Lower Corfton had to be cancelled recently due to problems with obtaining the tree whips but we hope to proceed with this later in the year. 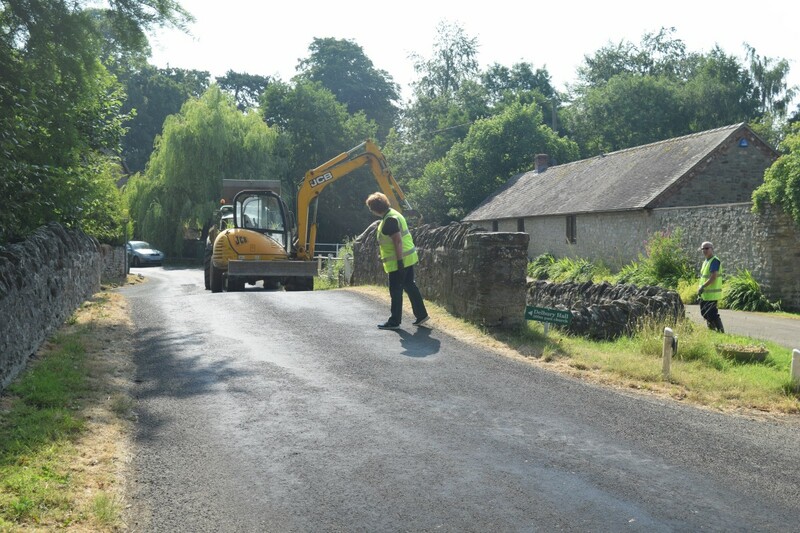 The work we had planned to do above Middlehope using the funds provided by Ludlow Rotary Club has had to be abandoned due to a lack of cooperation from the land owner. 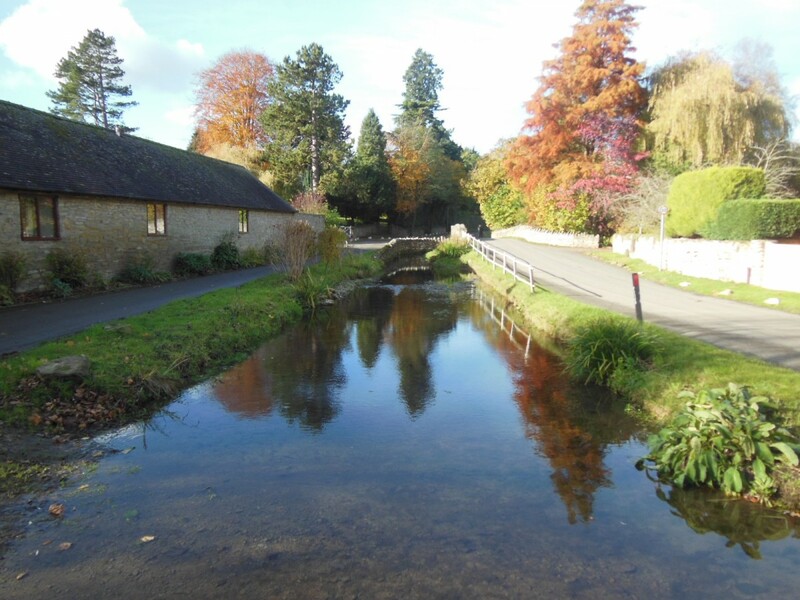 We hope to do alternative work there later in the year but in the meantime, Rotary have agreed that we can use the funds to do similar work elsewhere in the Corvedale – probably near Cold Weston. 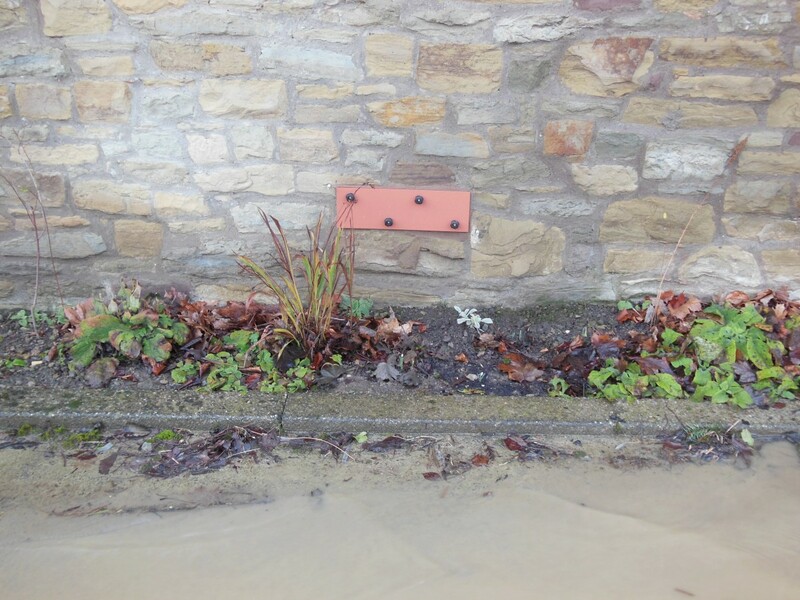 Due to persistence on the part of one of our supporters, the Council have finally unblocked the storm drain below Delbury Farm entrance in Mill Lane, Diddlebury. One of our members, Andy Kirk attended a Conference held in Birmingham last November. It was sponsored by the National Flood Forum and entitled "Let's talk about flooding". Andy has kindly produced a resume of the Conference and it is set out below. The NFF is a charity established to help, support, and represent people at risk of flooding in England and Wales. 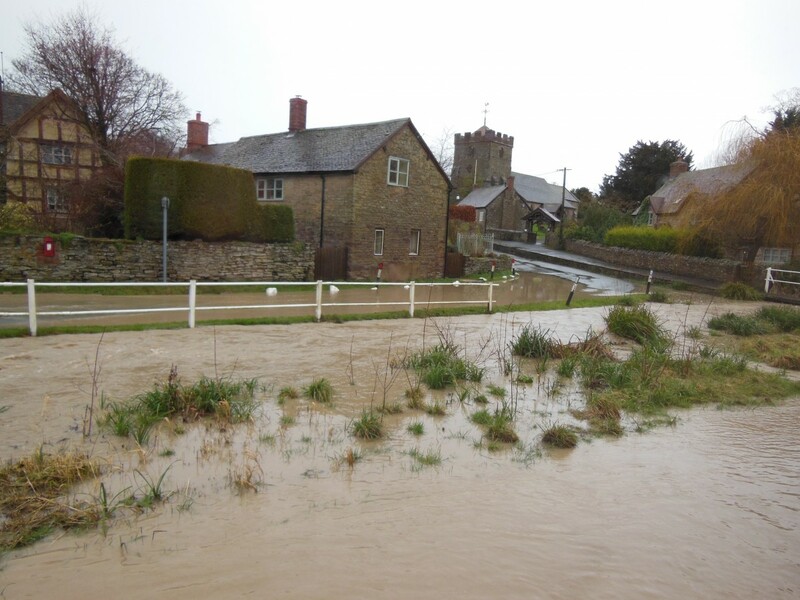 Diddlebury Parish Flood Action Group (FAG), as one of 300 flood action groups affiliated to the NFF, was invited to be represented at a conference in Birmingham last November, entitled: “Let’s Talk About Flooding”. This was just one of a series of events held across England and Wales with the intention of bringing people, not just flood action groups, together to talk about flooding, and share successes, issues, and concerns in all areas, and to identify what progress has been made and what the priorities are for the future. The event was supported by Flood Re, the joint Government and insurance industry initiative established to provide affordable insurance for qualifying properties at risk of flooding, or those that have already been flooded. The day was hosted by Dr Anne Wheeler, NFF Trustee, and Paul Cobbing, NFF Chief Executive. In their introduction they advised us that the outcomes of all these events were to be collated and taken forward to a national conference to be held later in 2019. It is hoped that the Secretary of State for Environment, Food, and Rural Affairs will address this conference. 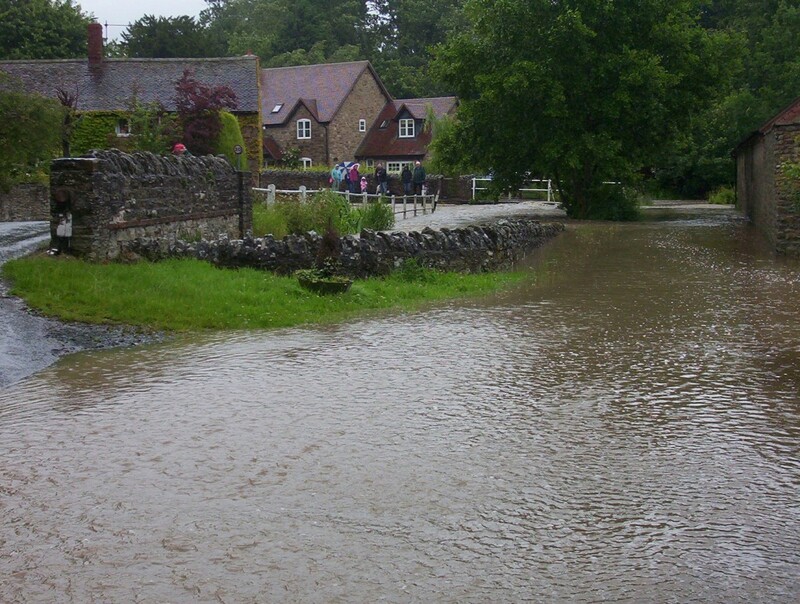 ‘joined-up’ thinking and action across all organisations involved in flood risk management. future management of SUDS (Sustainable Drainage Systems) installations. land management engaging with landowners in a non-confrontational way. create a ‘toolkit’ for flood action groups. improved Building Regulations and making houses resilient should become a national standard. decisions concerning projects and interventions should be made for the long term rather than to meet a short-term objective. ‘invest to save’ projects need to be encouraged. managing change, maintaining continuity of FAGs and their members. 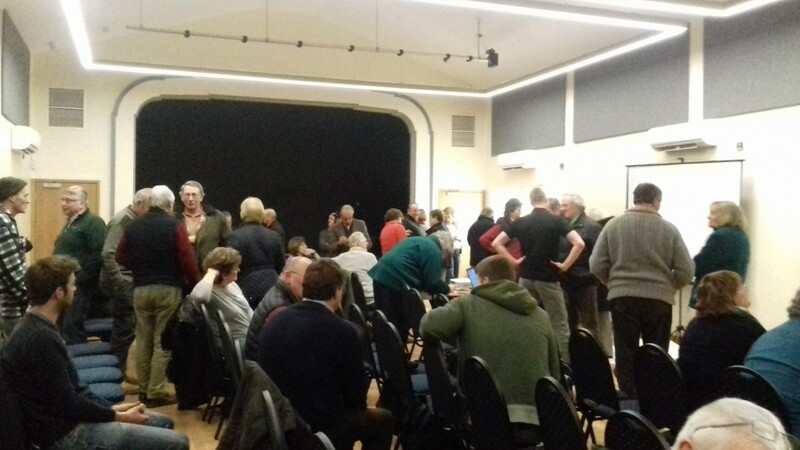 A session on individuals’, communities’, and parish councils’ actual flooding experiences followed, and discussions on successes and/or failures in early resolution of problems were debated. Issues raised included communication – disjointed among stakeholders; insurance – insurers slow to respond and difficulties in accessing Flood Re; SUDS – responsibility for future inspection following initial installation; risk management authorities – difficulty of changing personnel in the various agencies who tend not to co-ordinate with each other. Bob Haddon, Chairman of Shifnal Flood Partnership Group, established in January 2014, addressed the conference. With a large amount of new residential development, Shifnal now has much experience of all the flooding issues likely to be encountered, and he advised us accordingly. He welcomed queries from other FAGs and/or individual property owners – info@shifnalflood.org. Paul Cobbing concluded the conference stating that now is the moment to make an impact; apart from the national conference (location and date to be advised in due course) there is also to be a funding review in 2019. 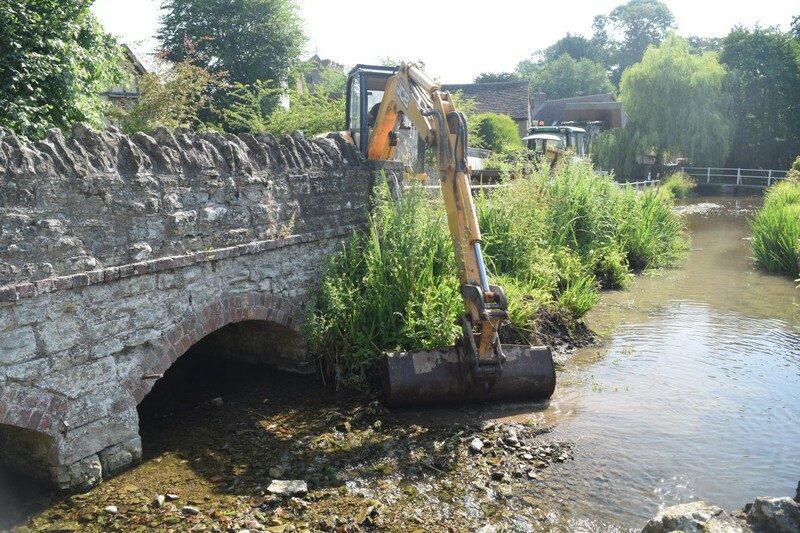 With the NFF gaining an increasingly higher profile, there is the opportunity to engage directly with the water companies, the Environment Agency, the Highway Agencies, and other bodies associated with flood alleviation. The NFF is encouraging anybody with an interest in or a worry about flooding to become a Friend of the NFF. It costs nothing, but the greater the number of Friends and supporters the more clout the NFF will have at central government level. Becoming a Friend provides access to regular bi-monthly online bulletins, and also available is a live feed 24/7 national flood warning facility which covers separate classifications of flood alerts, flood warnings, and severe flood warnings at relevant locations across the country. Become a Friend of the NFF now – sign up at nationalfloodforum.org.uk. 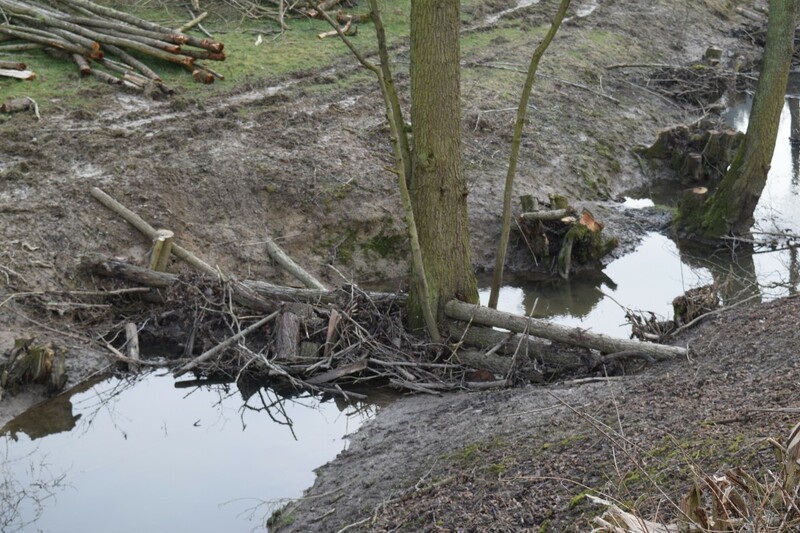 Following the recent wet weather, we took some images of the leaky dams installed in the watercourse below Wilderhope, just to the north of where the Longville Road turns off the B4368. 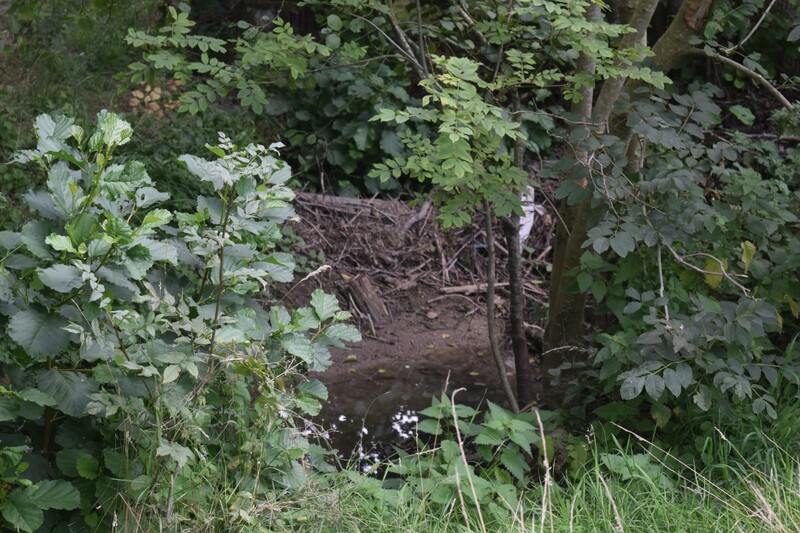 We photographed these dams as they are more easily accessible from a Public Footpath than are those on the Diddle Brook but the same principle applies to all such installations. As you will see from the images below, the dams are retaining substantial amounts of water - creating stilling ponds on their upstream sides. Each dam is different but some of them appeared to be holding back up to 500mm of water. Overall, they appear to be working well and Slowing the Flow downstream. 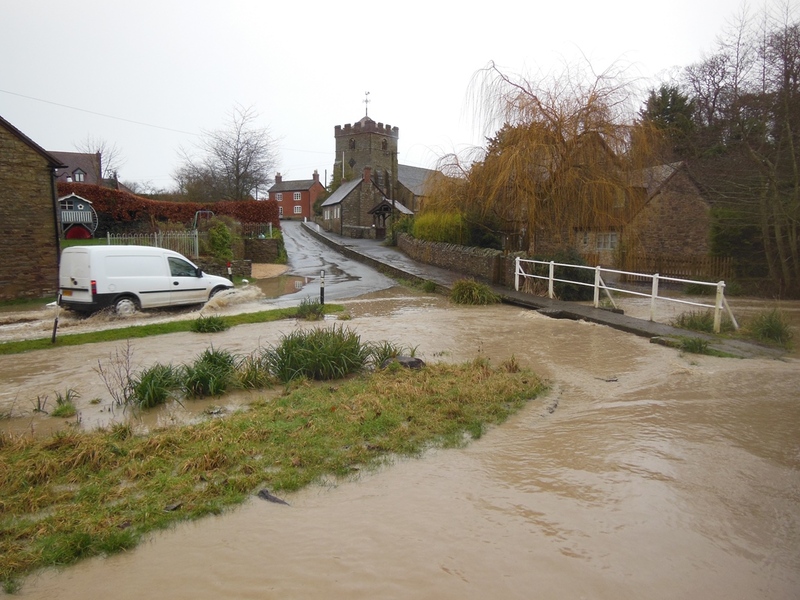 The Diddlebury Parish Flood Action Group is grateful for your interest in and support for the ‘Slow the Flow’ project that throughout the Corvedale catchment area has been project managed on behalf of the Environment Agency by the Shropshire Wildlife Trust. We are particularly grateful for the site visits that you have made during 2018 and for your role in securing support from the Department for Environment, Food and Rural Affairs. 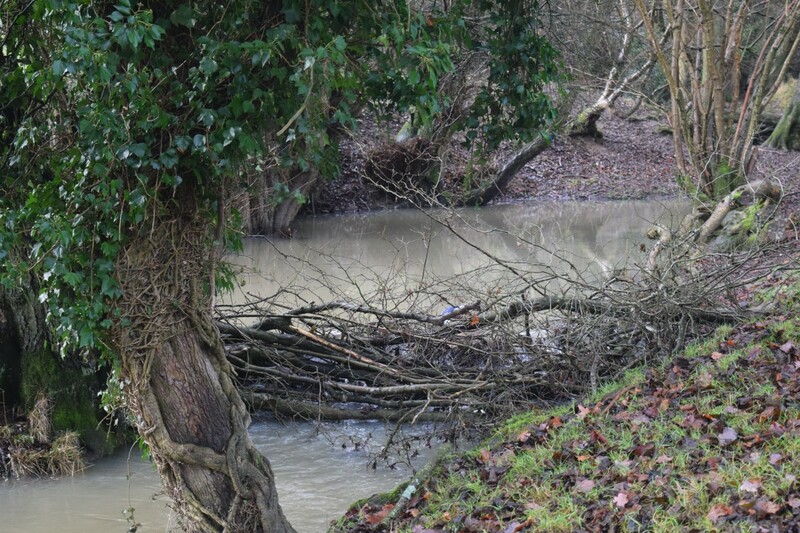 You may recall that the current project is dependent upon the goodwill of landowners and their voluntary agreement to any of the proposed flood alleviation work being undertaken upon their land. 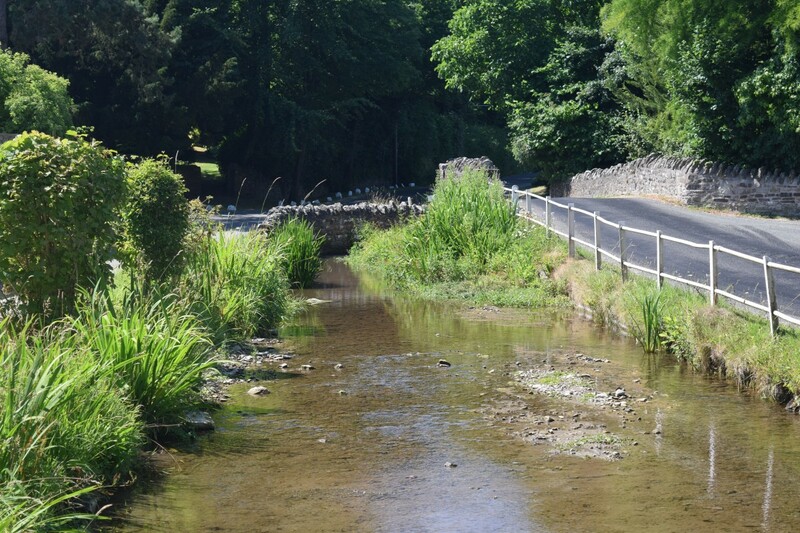 The Corvedale project has shown that the vast majority of landowners are willing to cooperate with flood alleviation works that can provide significant benefits not only to the wider community but also to their own farming activities. Unfortunately, it has also shown that there is a small minority of landowners who are unwilling to countenance any of the proposed works being undertaken, regardless of the wider benefits. It is on this aspect that the Diddlebury Parish Flood Action Group is now seeking to make representations. It is our understanding that the Secretary of State for Environment, Food and Rural Affairs has proposed that the principle that will underpin the proposed reforms under the new Environment Act should be “public money for public benefits”. We also understand that it is likely that the relevant Bill for this Act will come before Parliament shortly. 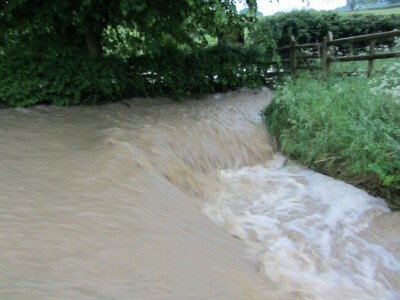 Accordingly, the Diddlebury Flood Action Group believes that the Bill and/or the associated Regulations should contain an absolute requirement for landowners to co-operate with appropriate flood alleviation works being undertaken upon their land, if they wish to continue receiving a public subsidy. Therefore, we should be grateful if you would be a Parliamentary advocate for this perspective. In a wider context, we fully support the Aims of the Wildlife Trusts as set out in their Campaign for a Wilder Future (https://www.wildlifetrusts.org/get-involved/campaign/wilder-future) and hope that you will also provide your support to this and assist in the passing of a strong new Environment Act. 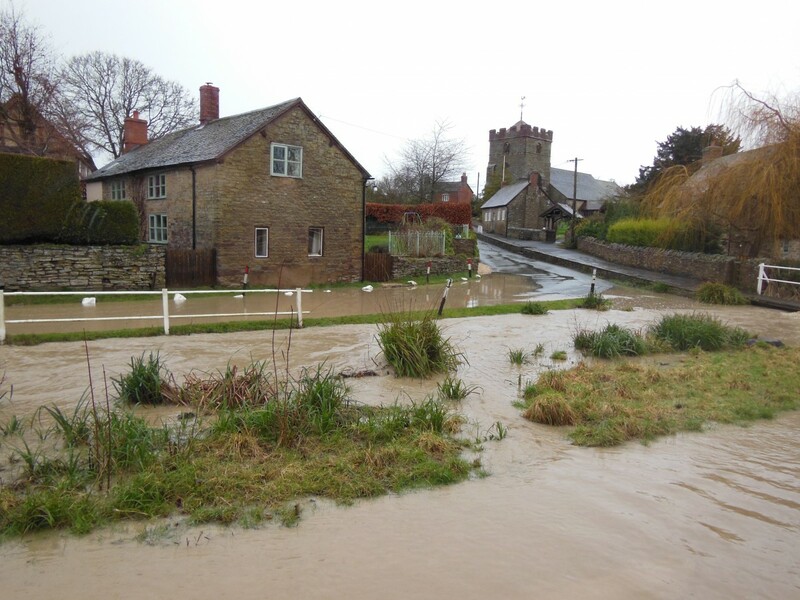 Following a recent site meeting with Richard Cheal of Shropshire Council (SC) at one of the two lowest-lying locations in Lower Corfton, agreement was reached over a plan of action to reduce flood risk. The area in question has been flooded in the past, and it is now hoped that SC’s contractors will shortly carry out emptying of road gullies and rodding of associated highway drain runs in the affected area. The eventual highway outfall runs into a brook which ultimately joins the River Corve. 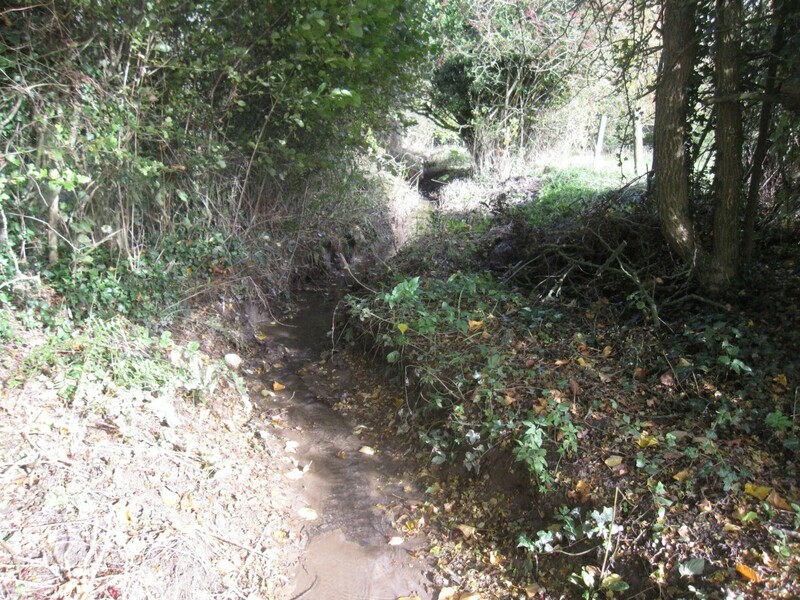 Mrs Harriet Horne of Corfton Manor has assisted in the alleviation of flood risk in this area by carrying out major clearance and de-silting of the brook to allow storm water to disperse as quickly as possible, thus further reducing risk of flooding to properties in Lower Corfton. The Shropshire Wldlife Trust have a source of free Black Poplars and some of these are to be planted over the next few months alongside the stream at Lower Corfton in agreement with Mrs Harriet Horne. 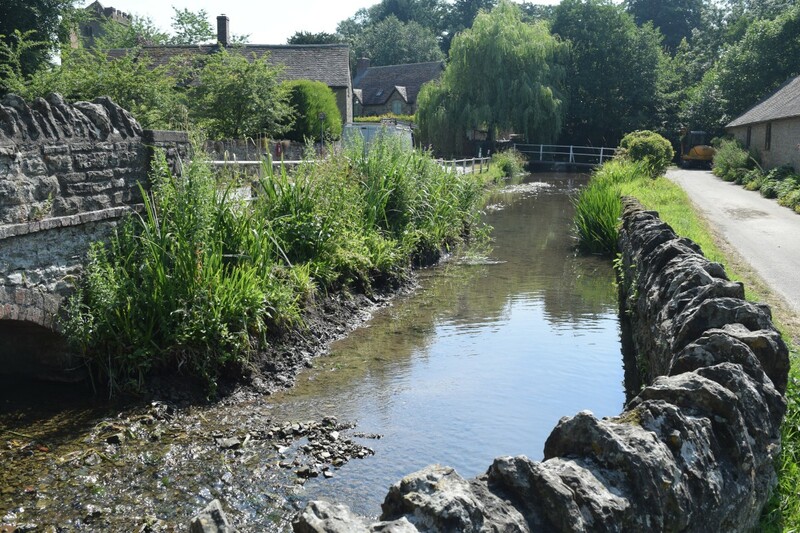 Since the last Report in July, we have had a successful stream Working Party which has cleared the stream bed through the village of excess weed growth and encroachment from the banks. 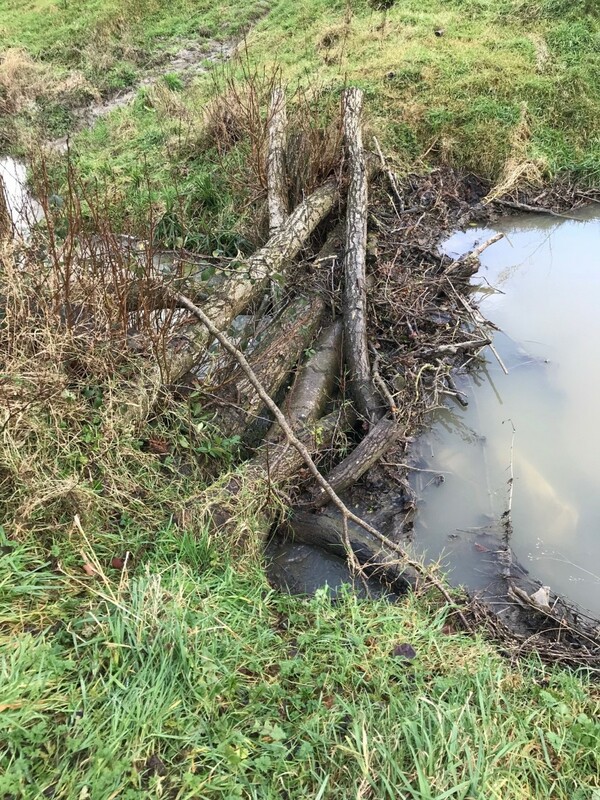 The Chairman of the Pontesbury Parish Council was shown round the leaky dams below Wilderhope earlier this week as he had expressed interest in using the same techniques in his area. The FAG was successful in their submission for funding to the Ludlow Rotary Club and an award of £300 has been made to us. This will be used to build more leaky dams above Middlehope. One of our members will be attending A Conference in Birmingham organised by the National Flood Forum on 10th November concerning Insurance against flooding. A Report back will be circulated to all members after the event. The Shropshire Wildlife Trust (SWT) plans shortly to aerate 75 acres of land near Clee St Margaret. They hope that farmers will then see the benefits of this work and keep doing it themselves. Aeration of land has many benefits, one of which is to increase its capacity to absorb surface water and hence reduce run off. 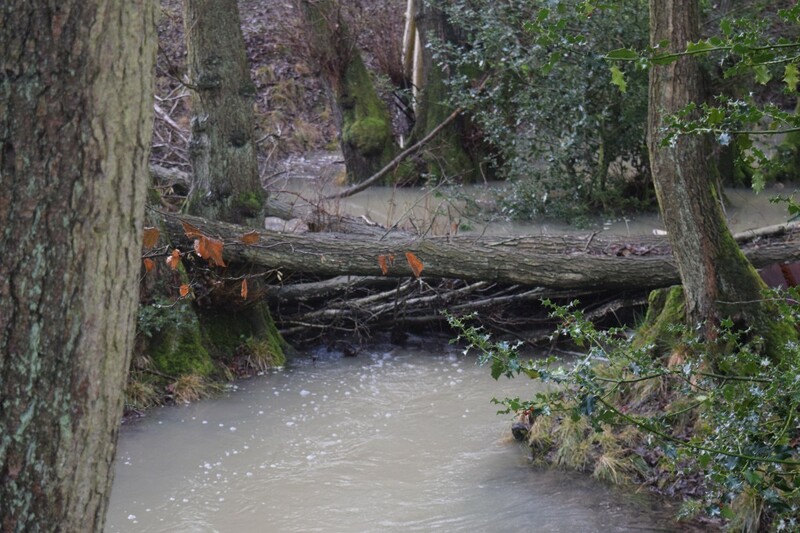 They have recently completed some Slow the Flow work at Heath and Tenders are out for 70 leaky dams, with a further 30 planned in the Pye Brook catchment. 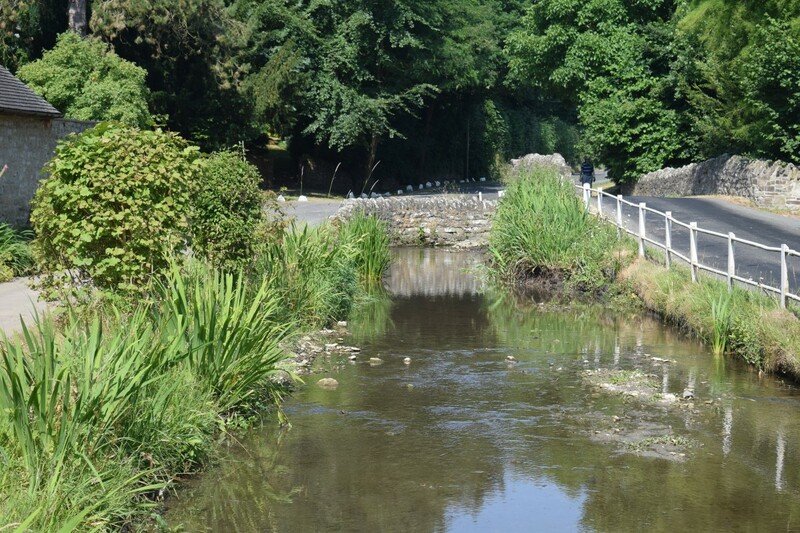 Cardiff University have started their Slow the Flow research project in the Corvedale and hope to Report by April 2021. Hopefully this work will enable promoters of Natural Flood Management techniques to quantify the results of their proposals and hence make it easier to obtain funding. This is cutting edge stuff in the Corvedale! SWT has recently received £28,000 for tree planting with assistance from the Woodland Trust. They will initially be working near Shipton and would welcome any volunteers to assist with this work. If you are interested, please email me for more details. In the longer term, post Brexit, the funding of farming is going to change. The FAG is considering how best to approach the local farming community upstream of problem areas to see if they are aware of the problems their present land management techniques can cause to properties downstream and to try to work with them, and the SWT to change their practices to ones less damaging and hopefully beneficial to the farmers as well. 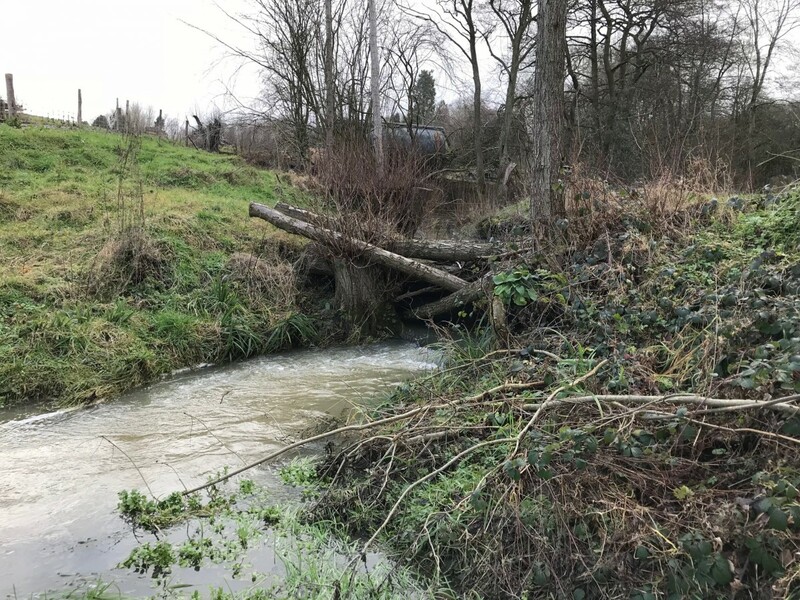 The SWT uses software called SCIMAP which can predict the effects downstream of upstream changes and this could be a useful tool to use in trying to persuade farmers to change their ways. 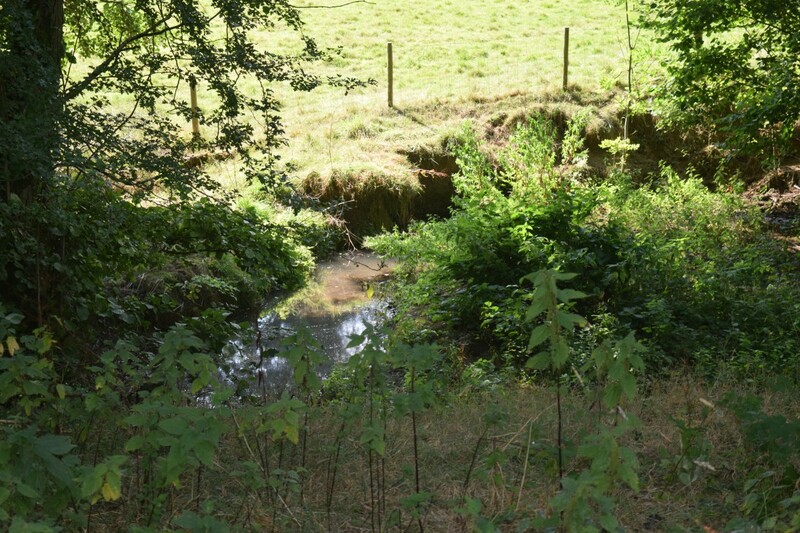 The Group were kindly invited by Luke Neal of the Shropshire Wildlife Trust (SWT) to view the approximately 50 leaky dams which were installed in the Diddle Brook upstream of Diddlebury village under his direction and with the kind permission of Delbury Estate in February 2018. 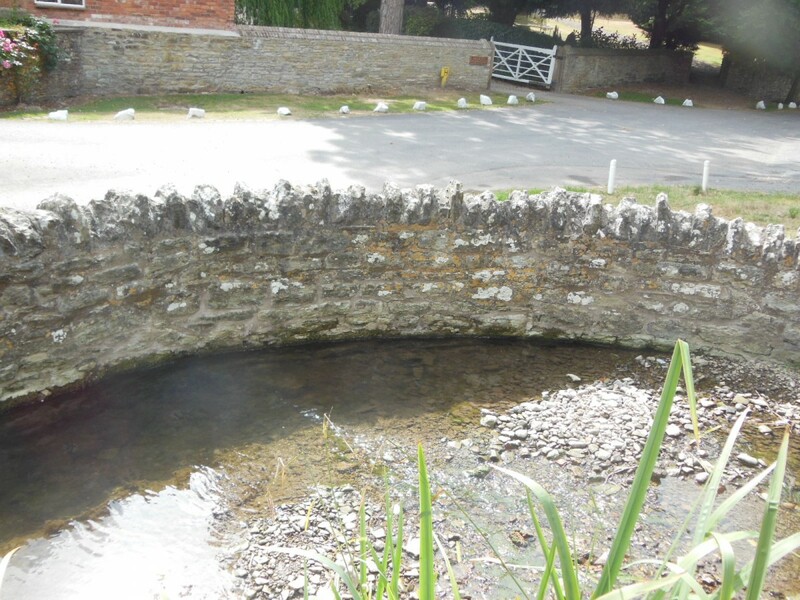 The Group went firstly went to the stream near Preens Barn between Middlehope and Burwood. This is a tributary of the Diddle Brook which drains the area around Burwood. From there we went to Middlehope and saw the area which was flooded by the storm at the end of May. Finally, we went to Dunstans Lane and walked along the Diddle Brook in both directions looking at the different dam types and locations, the reasons for which Luke explained. The dams were of differing designs. Each one is tailor made to suit the local conditions but the construction is generally as described below. The small trees normally used for the main dam structures are placed across the stream just above bed level. 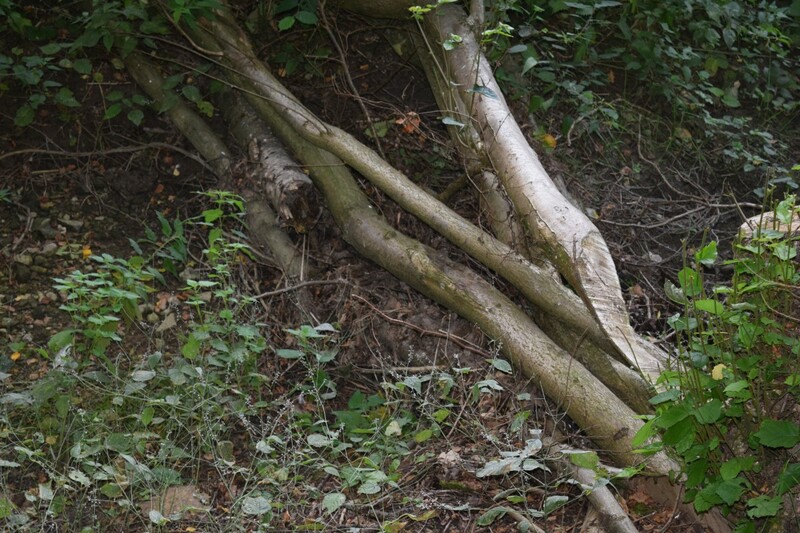 Each end is fixed to the banks by staking or occasionally, the tree is pinned to the bed itself. 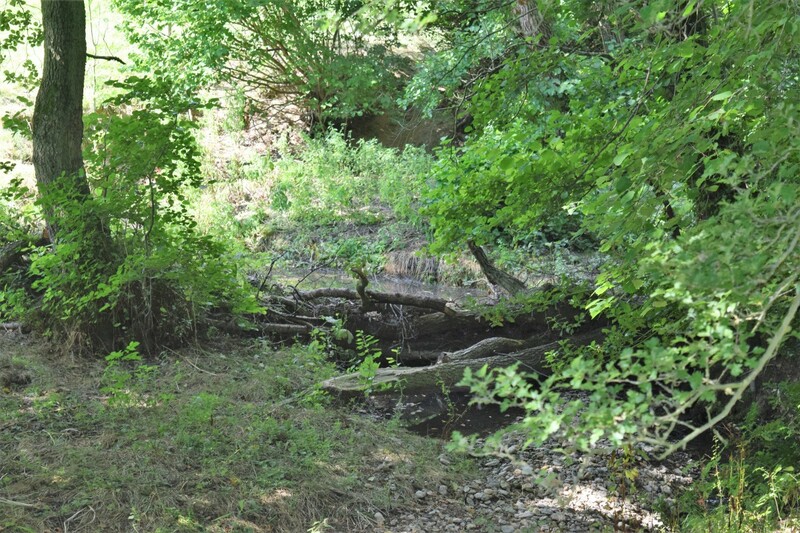 Smaller branches and brushwood are piled against the dam on the upstream side. The idea is to trap as much of the flow as possible above the dam before it finally forces its way through thus delaying the peak flow in the stream. Each dam has only a small effect but the cumulative effect of many such dams is significant and can reduce peak flood flows by around 10%. 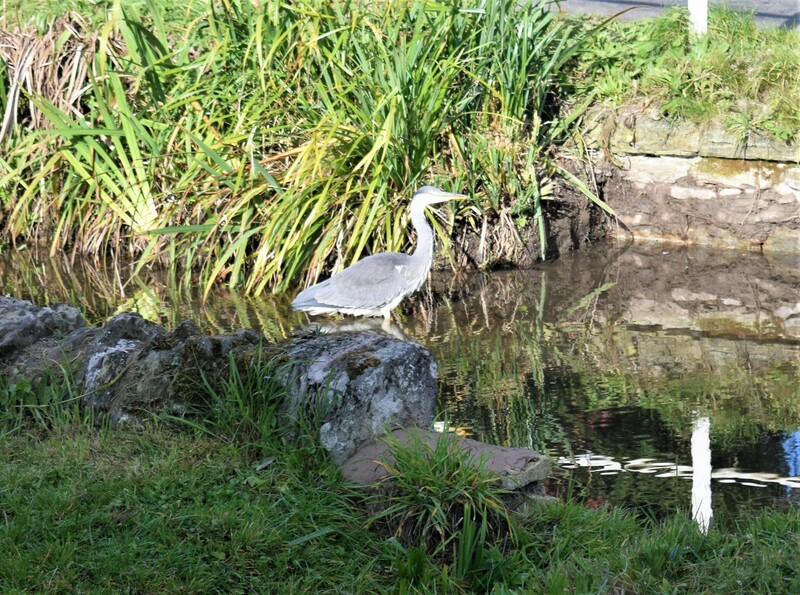 From the perspective of SWT, the dams also provide new areas of suitable wild life habitats and act as siltation ponds so are a win win situation. The SWT also promote other means of Slowing the Flow by aerating the soil in fields to increase the absorption of surface water and again reduce peak flows. Images of some of the dams visited are below. 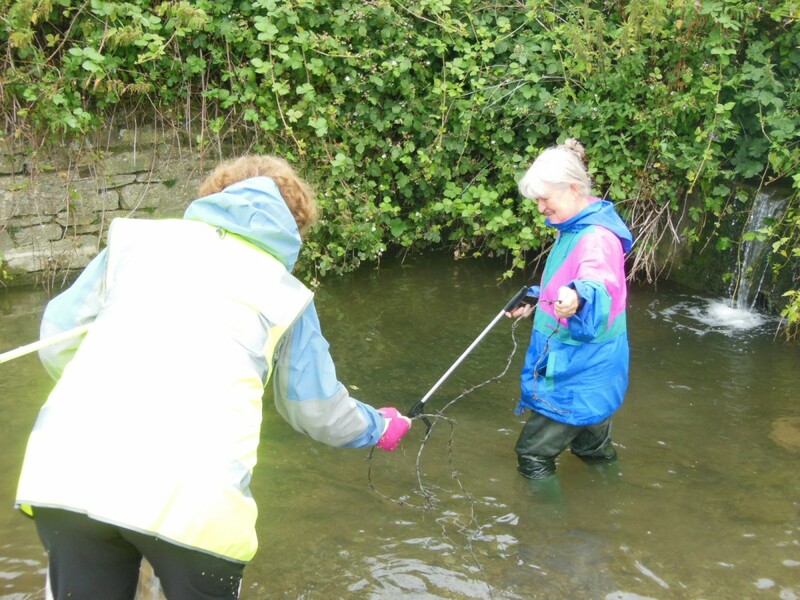 The Environment Agency (EA) hosted this Roadshow in Worcester on 23rd May 2018. 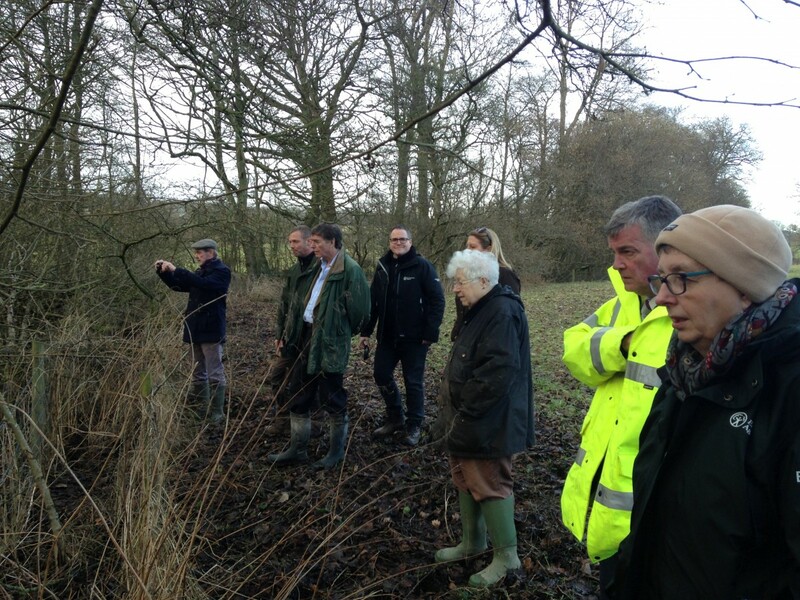 Attendees included many representatives from local and county authorities, the Forestry Commission and DEFRA, and a significant number of EA delegates; disappointingly only three Flood Action Groups were represented. The aim of the Roadshow was to promote understanding and to champion the use of Working with Natural Processes/Natural Flood Management (WWNP/NFM) to reduce flood risk. This strategy provides the means to help achieve a wide range of benefits for people and the environment by taking an integrated approach to catchment management. Strategic planning is necessary to create schemes which will provide multiple benefits focusing on the small communities which are less likely than their larger neighbours to be able to secure appropriate funding. Building and structuring relationships between organisations, the public sector, and local communities provides proper partnerships to take projects forward. Cost-effective solutions are required in terms of both resources and ongoing maintenance, and these can be achieved by carefully considered partnership working. The EA has now undertaken and published 65 case studies which provide evidence-based examples of projects which have now resolved previously existing problems (see www.gov.uk/government/publications/working-with-natural-processes-to-red...). These studies cover rivers and flood plains, woodlands, run-off, and coasts and estuaries. DEFRA has provided funding of £15m to help in developing the knowledge to find solutions for future implementation. This has benefited much of the country already, covering Yorkshire, the West Midlands, Wessex, Lincolnshire and Northamptonshire, Devon and Cornwall, the Solent and South Downs, and Cumbria and Lancashire. Also proposed are GCSE/A-level educational modules to promote the multiple benefits of NFM for people, communities, and wildlife. DEFRA/EA is also in the process of funding and preparing an NFM design guide. Apart from stand-alone WWNP/NFM projects, it is accepted that in many cases traditional engineering solutions will still be required. These, however, will often still benefit from being carried out in conjunction with the WWNP/NFM processes. 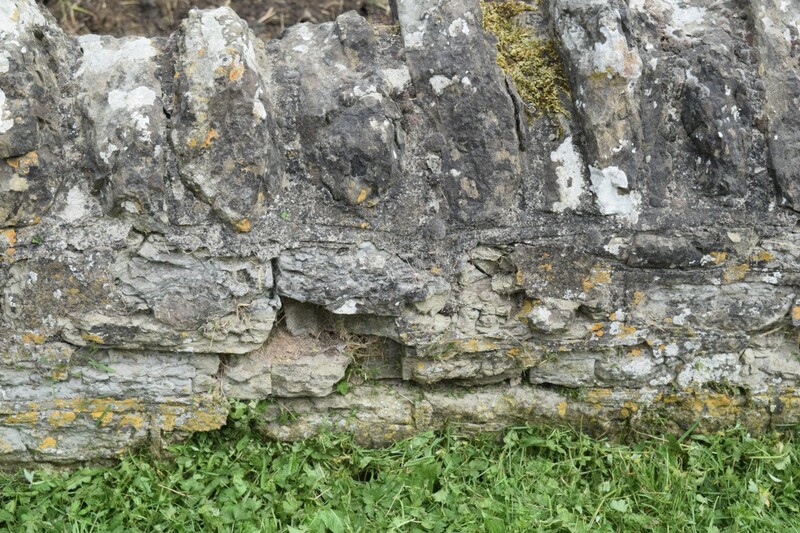 The re pointing work has been completed and the wall is now safe for many years to come. Our thanks to the Diddlebury Parish Council for funding this work. 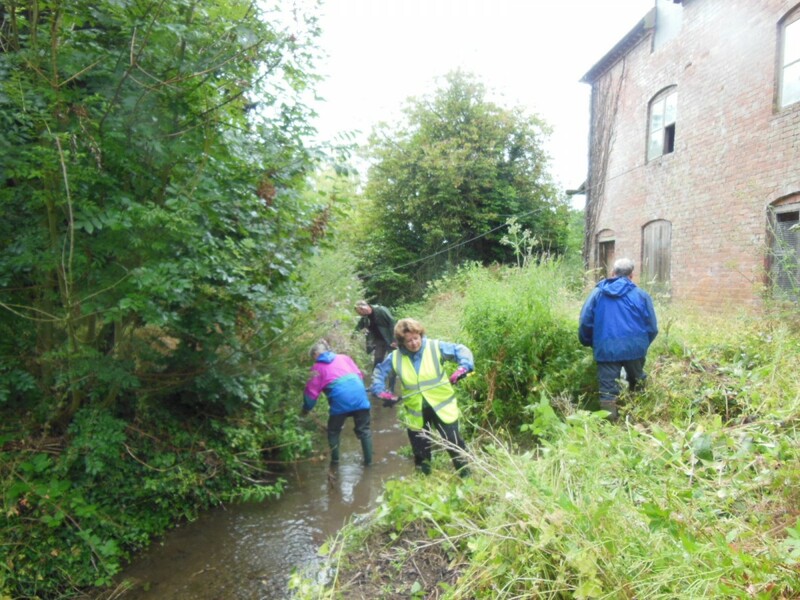 The object of the exercise was to walk the length of the Diddle Brook from the Mill Lane footbridge to its confluence with the River Corve and to pick out all litter from the stream en route. The Shropshire Wildlife Trust (SWT) kindly provided us with Hi Vis jackets, rubberised gloves, litter pickers and plastic bags in which to collect the rubbish. Four members together with Luke Neal of the SWT did the walk this morning with the kind permission of Mr Patrick Wrigley of Delbury Estates, the land owner and also of Mr Topher Morgan and Mr Stephen Povall who farm the land. 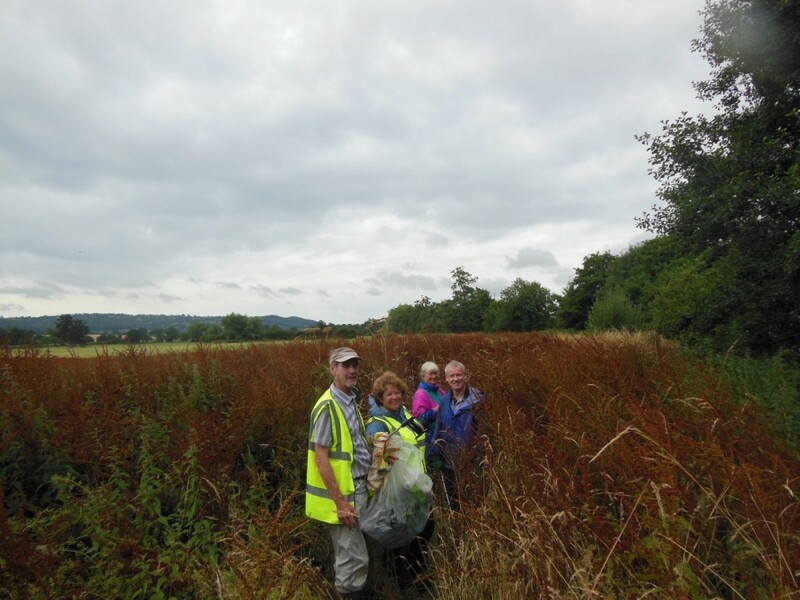 As well as picking out the rubbish, we also destroyed a number of Himalayan Balsam plants which were growing alongside the stream. The types of litter removed and its location were noted on a Form and this information will be fed into the SWT data base. The material was mostly plastic. The litter record Form will help the SWT to understand the sources of plastic pollution and improve the work to address this problem. They are partnered with the Marine Conservation Society and will be sharing their results with them. 80% of marine plastic pollution comes down our rivers, it’s time to stop the plastic tide! The following images show work in progress and the total amount of rubbish collected. The rubbish will be properly disposed of. The silt build up had become too large to deal with by hand so arrangements were made to borrow a suitable machine from Topher and a tractor and trailer from Andy. The work was done this morning after the school rush traffic was over with volunteers in Hi Vis jackets controlling traffic. Andy expertly drove all the machines and the work was completed in just under an hour. 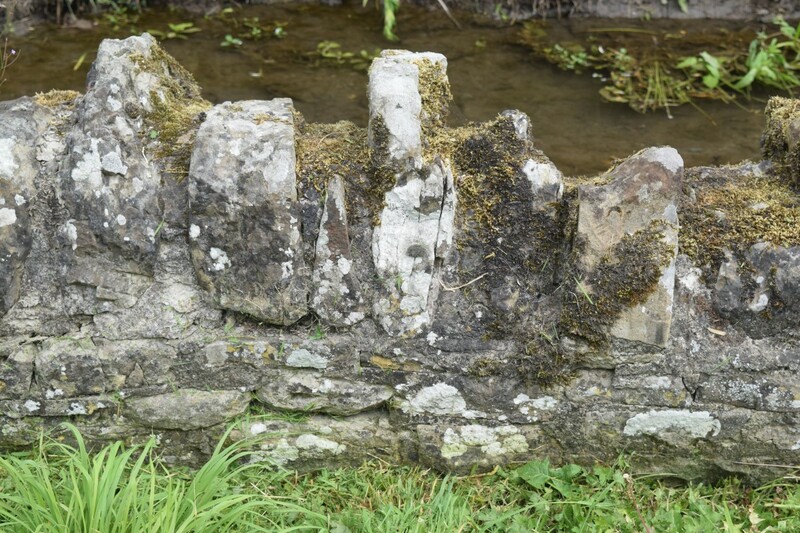 The opportunity was taken to remove two large unsightly concrete blocks which had found their way into the stream and also the heap of weeds etc which had been removed from the stream by previous working groups. The Irises along this part of the stream bank were largely preserved in the remaining strip by the roadside wall. Future maintenance will now be undertaken by the FAG during their regular working groups. The cost of the work was met using DPC funds allocated to the FAG. 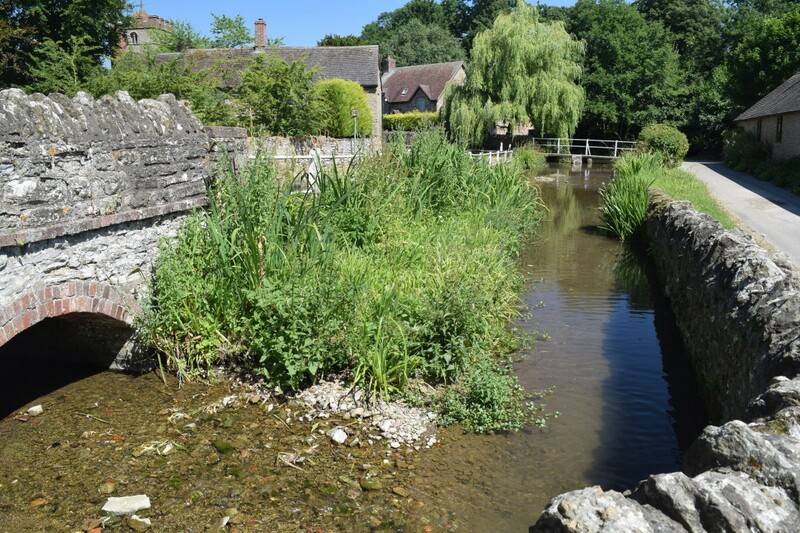 Since the last Report in January, we have had a successful stream Working Party which has cleared the stream bed through the village of excess weed growth and encroachment from the banks. 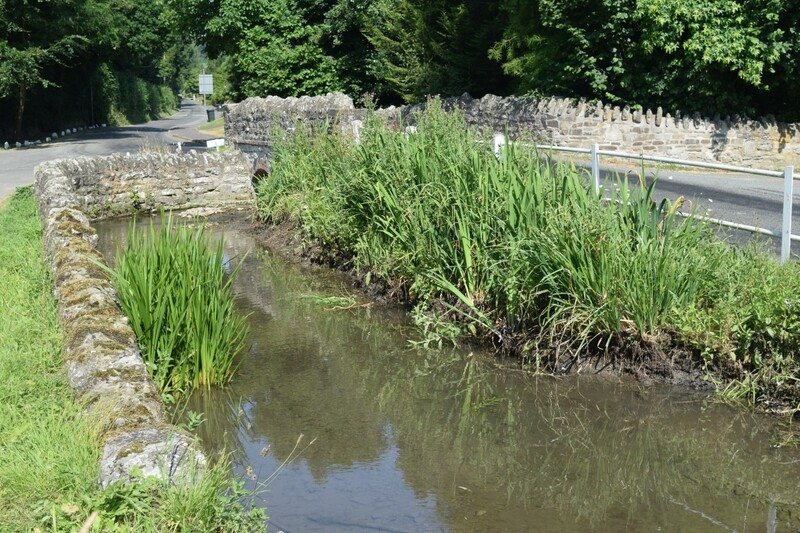 Work on de silting the Diddlebrook below the Mill Lane bridge is now scheduled for mid June in accordance with Guidelines from the EA. The necessary Consent has been issued. 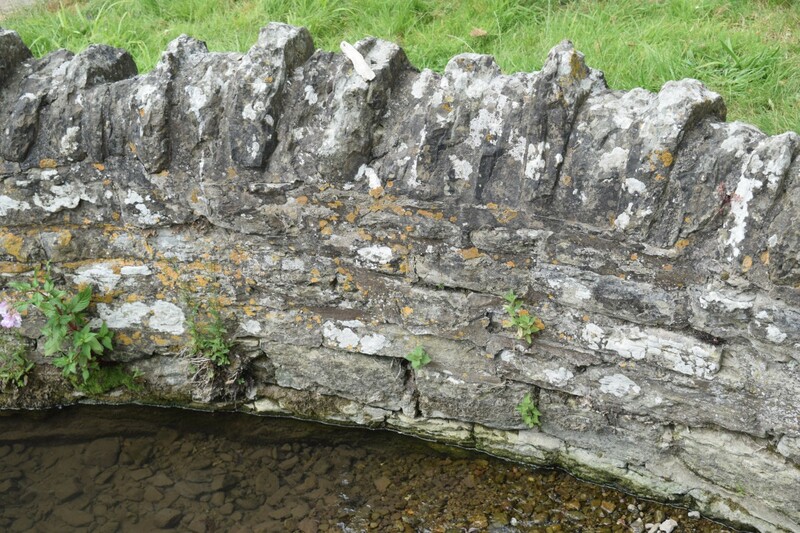 In the absence of funding from any other Agencies and to avert the risk of flood damage, the DPC have kindly agreed to fund repair works to the wall beside the Mill Lane bridge as this is in a poor state of repair. The work will take place in July when the flows are low. 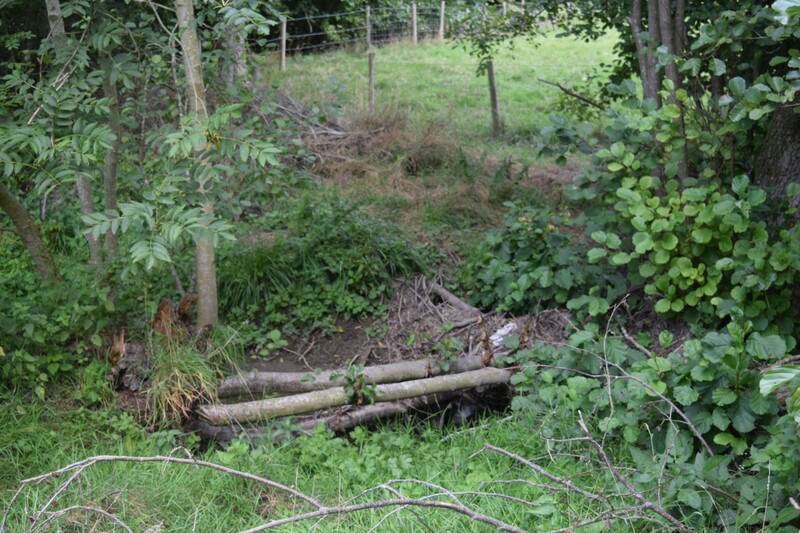 We can confirm that all the 50 leaky dam structures have now been completed in the Diddlebrook catchment. These were tested by the storm which occurred in the evening of Thursday 31st May. 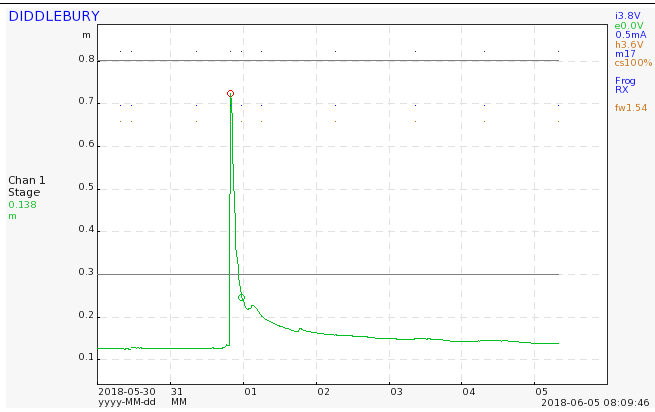 The water level at the depth gauge by the B Road bridge is shown in the graph below. 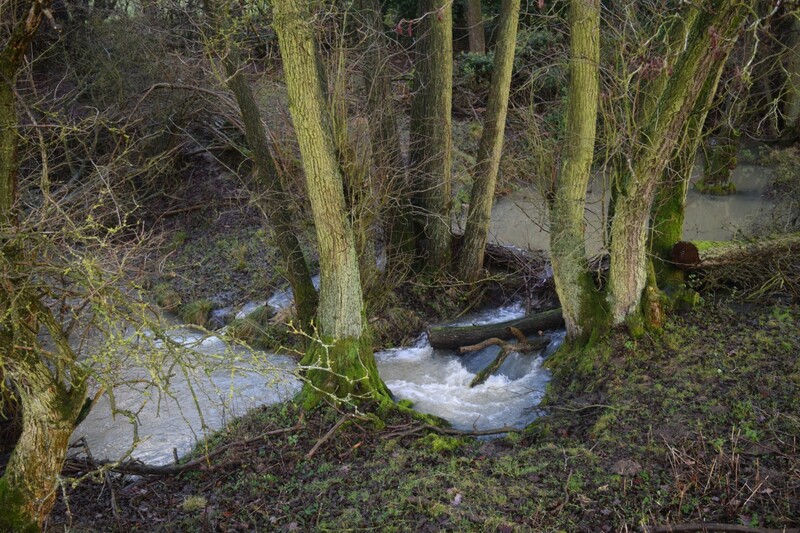 Despite quite serious flooding in Middlehope which is above the dams (estimated to have been a 1 in 20 year event and illustrated below (images by Laurie Robinson)), the stream remained within its banks through Diddlebury village. In our opinion, such severe rainfall would have resulted in flooding within the village in the absence of the 50 new leaky dams now in place below Middlehope. 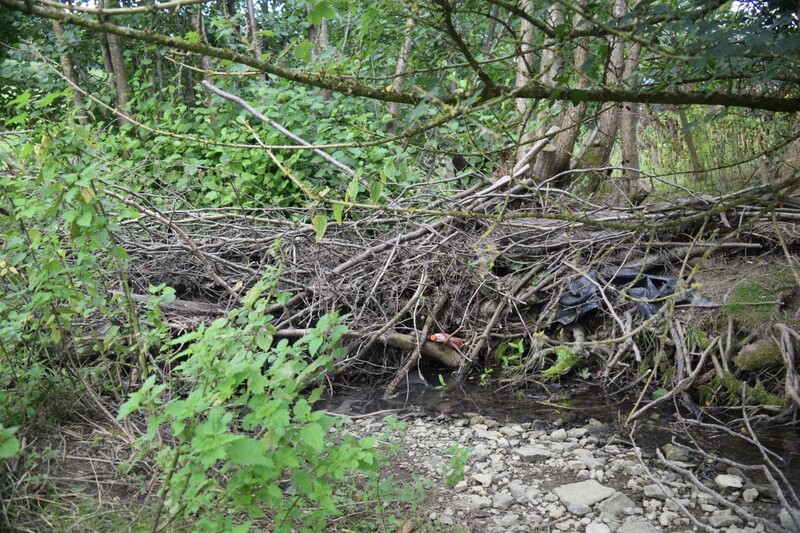 Work on designing and constructing new such structures is now proceeding in the Pye Brook catchment around Clee St. Margaret and it may also be possible to add further ones upstream of Middlehope in the future. 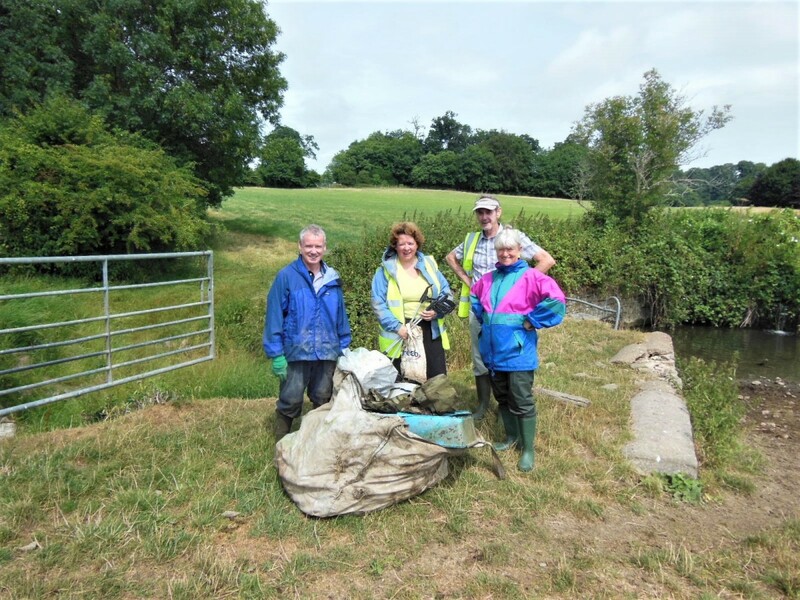 Several of our members have volunteered to take part in a litter picking exercise sometime in June along local watercourses as part of a scheme throughout the Severn Catchment. The Diddlebury ducks are back! Under the new Data Protection Regulations, we are unable to identify each duck by name or to provide their web address. 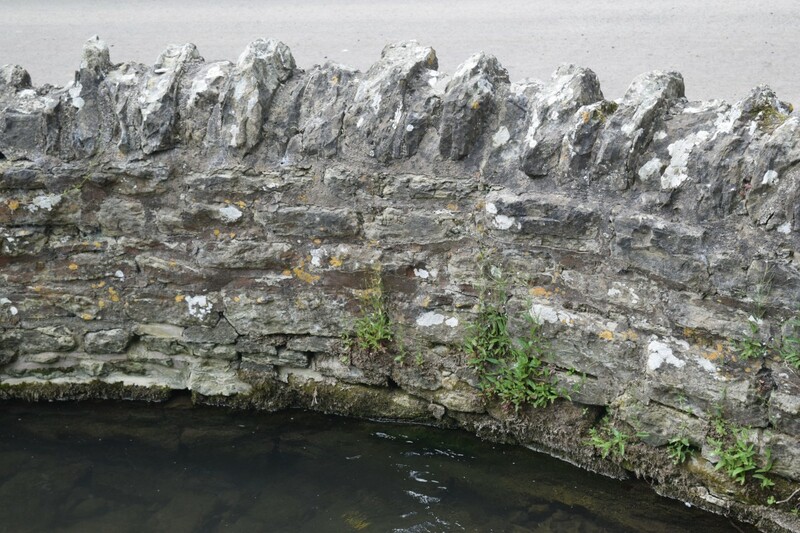 Since the last Report in January, we have campaigned against the proposed swingeing increases in Consent Charges proposed by the Environment Agency for works on Main Rivers. 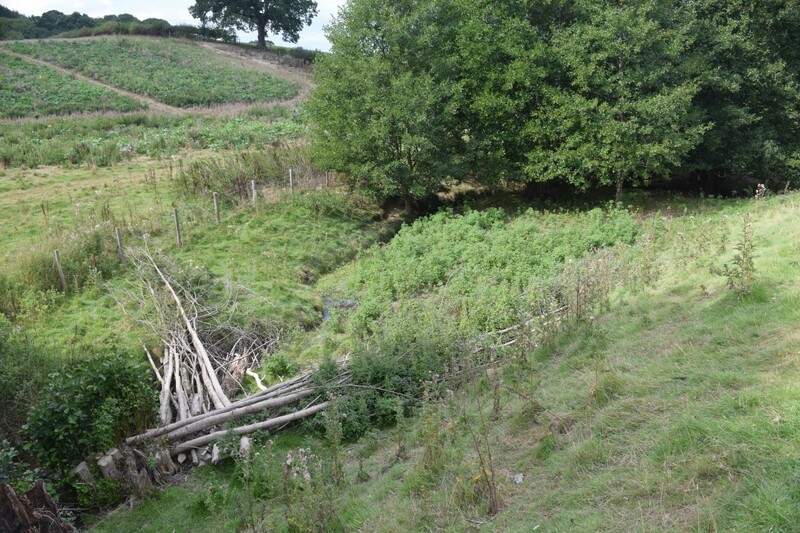 Although the watercourses we deal with are Ordinary Watercourses whose Consent Charges are regulated by Shropshire Council, the construction of our leaky dams is carried out and funded on our behalf by the Shropshire Wildlife Trust (SWT). 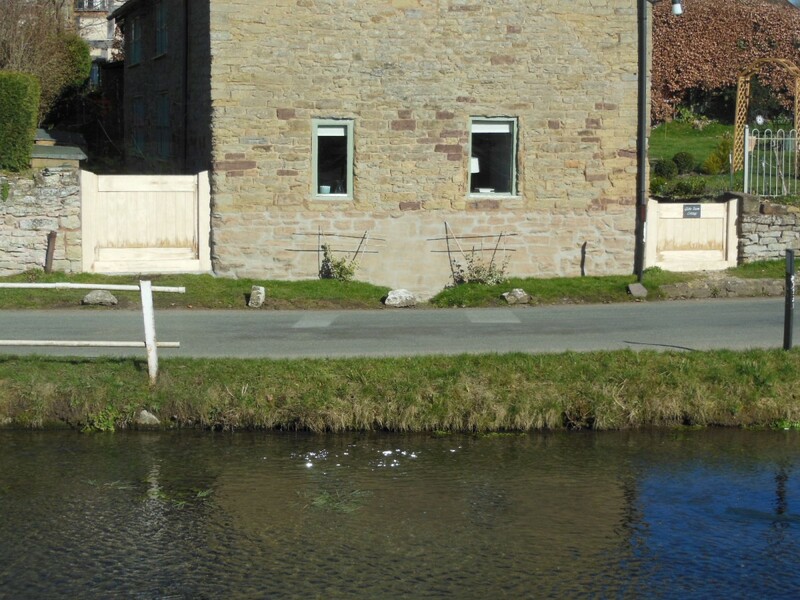 The SWT carries out many works on Main Rivers and the increased charges would have involved them in added costs amounting to nearly £200,000 pa in the Corvedale alone. 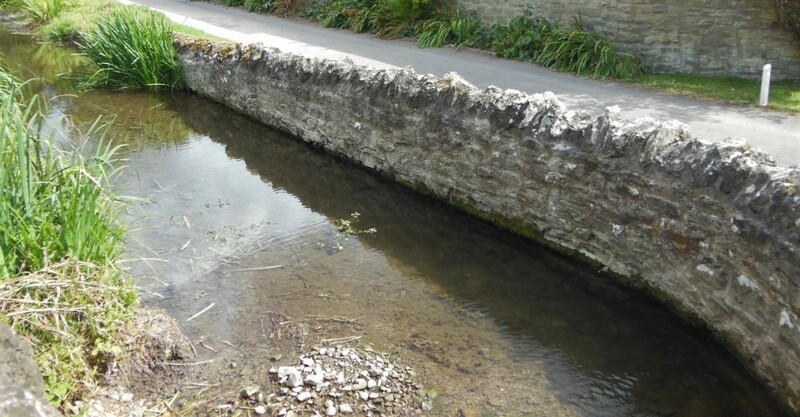 Spending all this money on Consents would have meant that much less money being available to actually build things – not just in Main Rivers but also in Ordinary Watercourses such as the Diddle Brook as all their funds come from the same pot. This was raised at the meeting held in Culmington in February with Mr Philip Dunne, our local MP and the DPC subsequently wrote in with their support during the Consultation Period. There was much concern over the whole Country amongst groups of volunteers such as ours and I am pleased to be able to report that the Government listened. In the recently published list of new Consent Charges, following the Consultation Period, the Consent Charges for our type of work have not been increased. 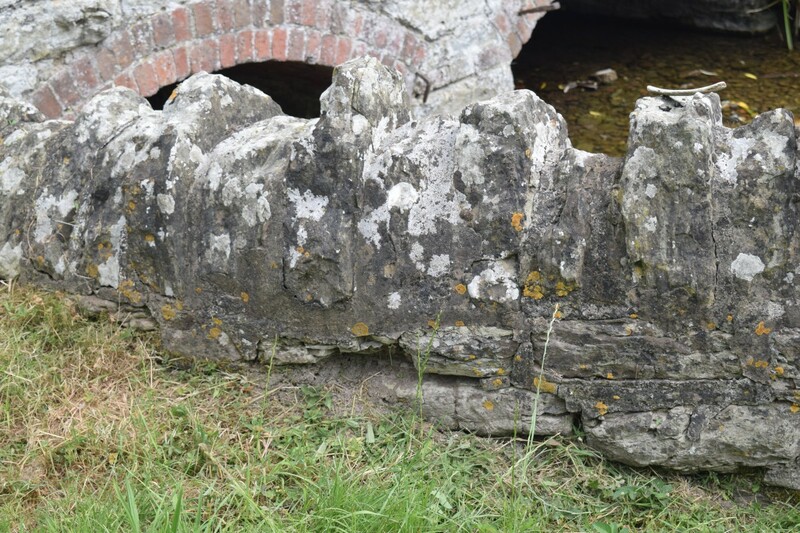 We have also written to Mr Dunne and our local Shropshire Councillor Cecilia Motley regarding the current almost complete lack of maintenance of drainage structures in the Parish. Mr Dunne has conveyed our concerns to the Council and we await their response. 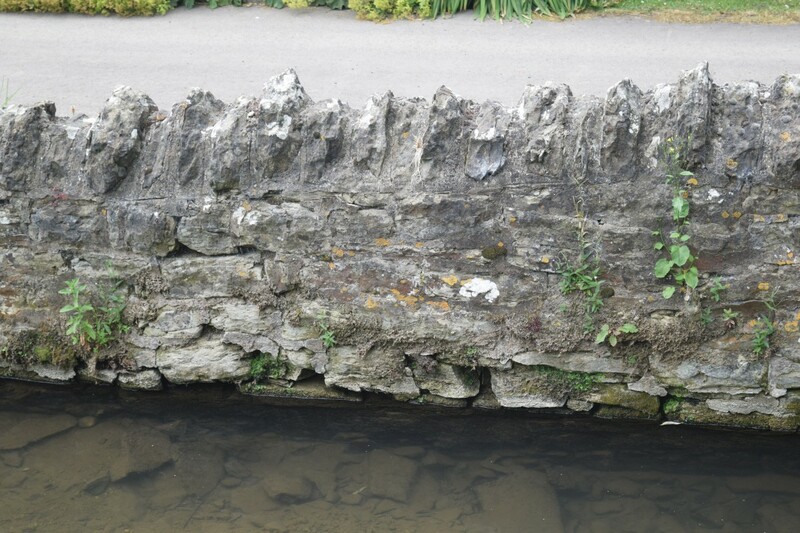 In the meantime, in the absence of funding from any other Agencies and to avert the risk of flood damage, the DPC have kindly agreed to fund repair works to the wall beside the Mill Lane bridge as this is in a poor state of repair. 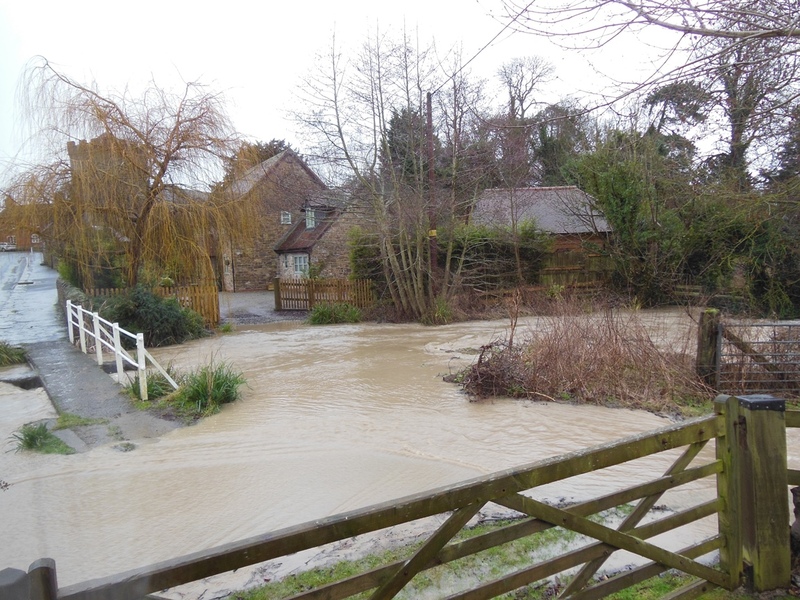 Roads Dept did eventually clear the blocked pipe near Patch Cottage in Sutton and water is now getting away. 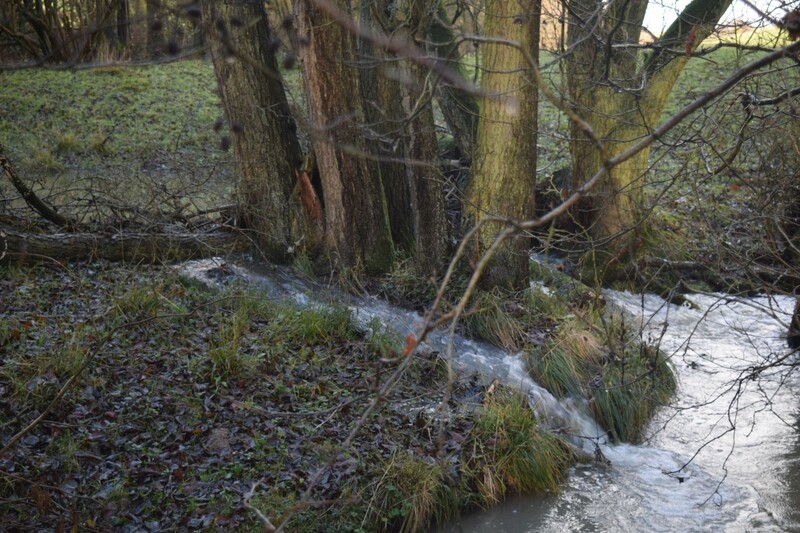 We can confirm that all the 50 leaky dam structures have now been completed in the Diddlebrook catchment. 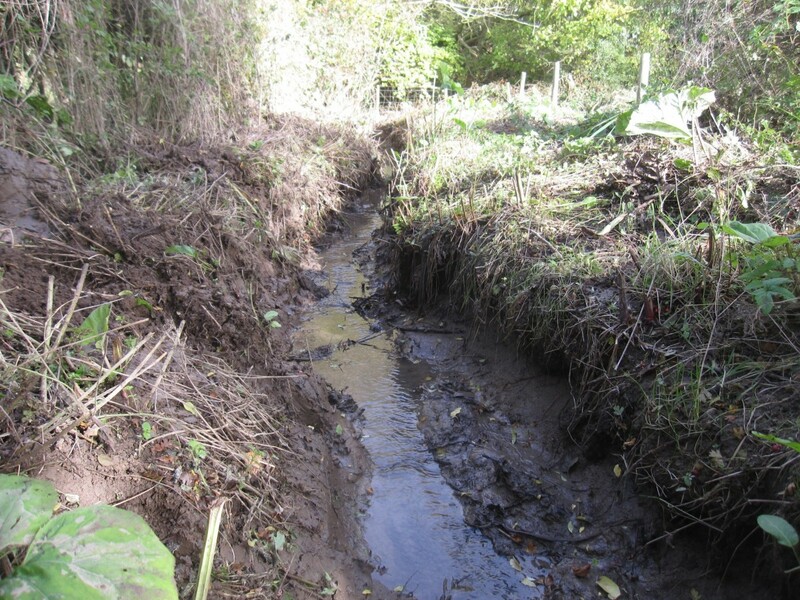 Work is now proceeding in the Pye Brook catchment. 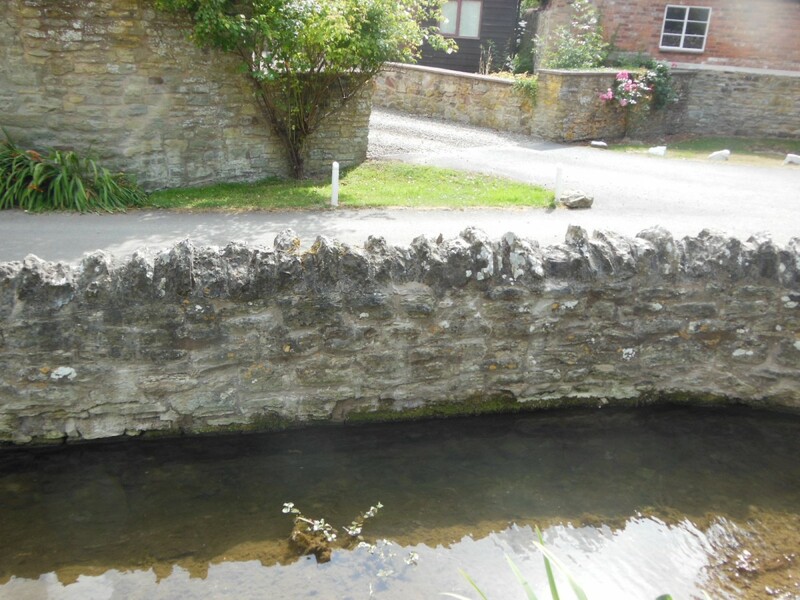 Work on de silting the Diddlebrook below the Mill Lane bridge is scheduled for early May. 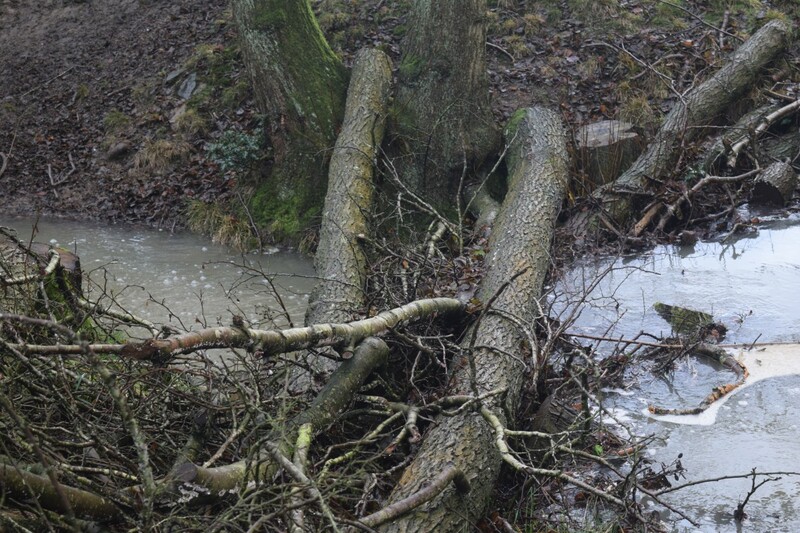 Below are some images of leaky dams in action showing how they do have a significant effect on slowing the flow. 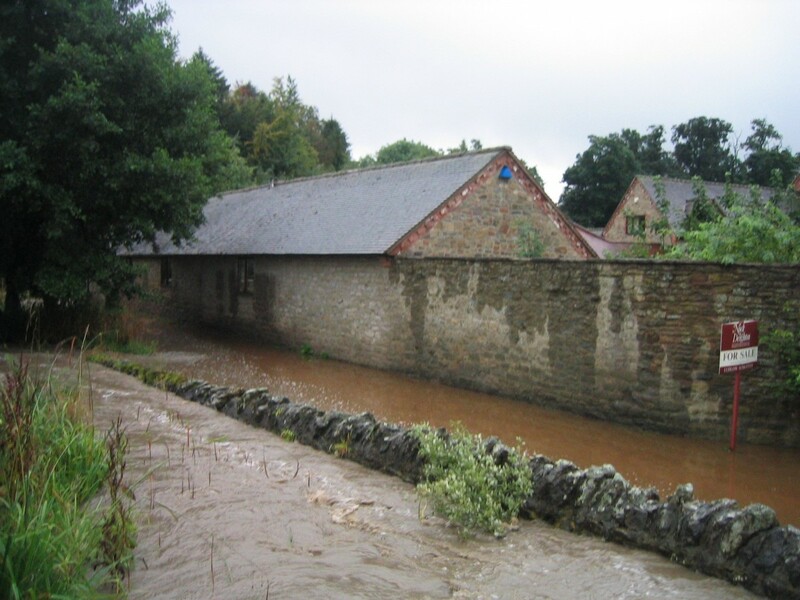 Flooding of your house, business premises or farm yard can be devastating. Whilst it is not possible to completely eliminate the risk of flooding, there are things which can be done to lessen its dire effects. 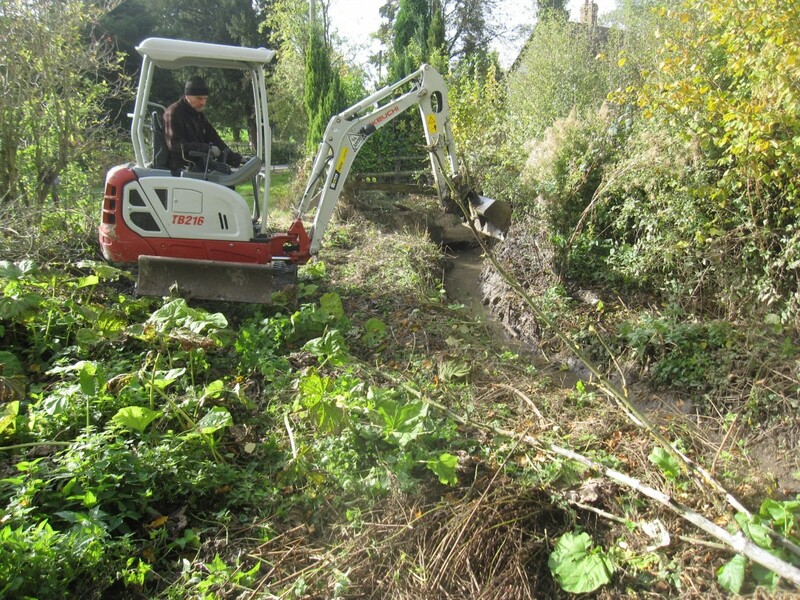 Small works carried out at a small cost are being constructed by the Shropshire Wildlife Trust on our behalf in the upper catchments of the River Corve and its tributaries and these will, by temporarily storing flood water, reduce the peak flood flows downstream. Such works can include leaky dams, off course storage, hedge and tree planting, reduction of cattle poaching, aeration of soils so that they can absorb more water and so on. Apart from their prime purpose in flow reduction, such works can also result in improved farmlands with higher productivity. 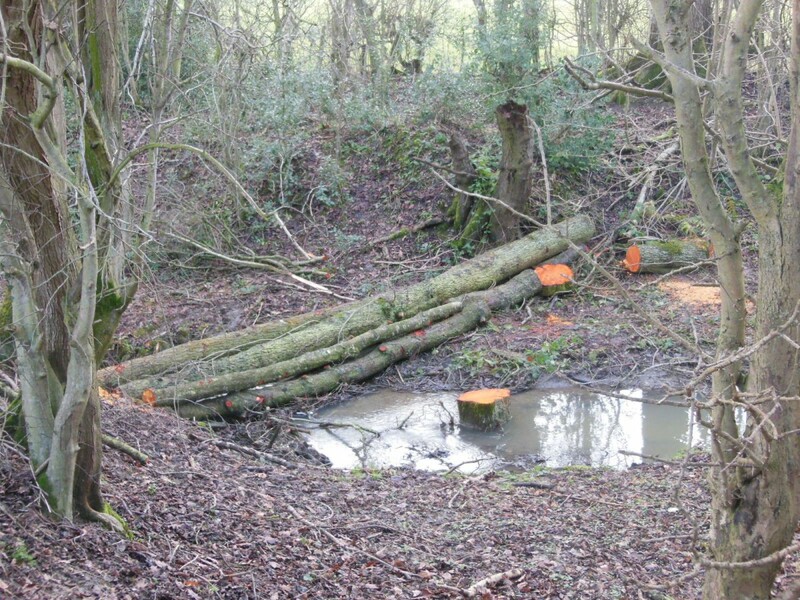 These installations may sound so small as to be ineffective but when they are inserted in large numbers – 130 leaky dams below Wilderhope for example – they have a cumulative effect. Although such techniques – collectively known as Natural Flood Management – are quite new, such data as has been collected to date indicate that flood peaks can be reduced by around 10%. This can translate to a local flood peak level being reduced by say 3 or 4 inches and that could make the difference between your property being flooded or not. None of this work could be carried out without the permission of the land owners. Below a certain point in the catchment of each tributary, it becomes futile to build items such as leaky dams as by then, flood flows would wash them away. 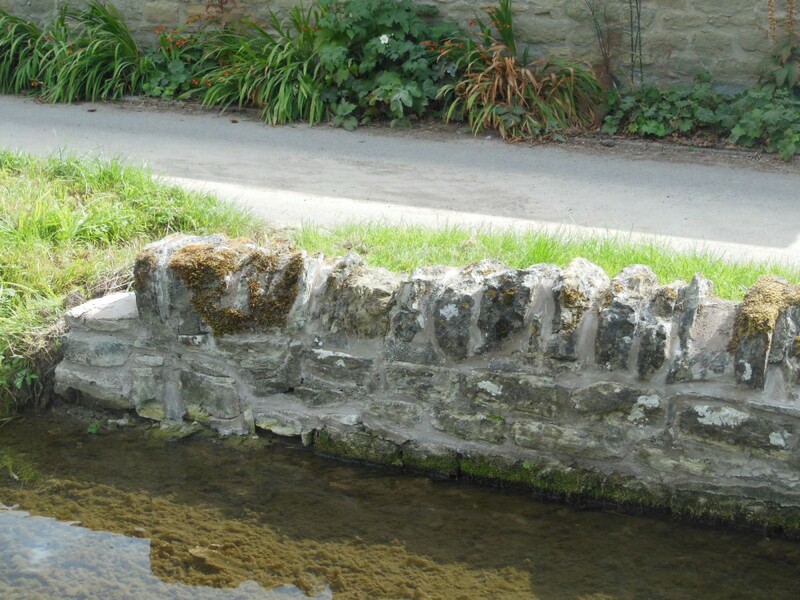 As streams enter built up areas therefore, a different approach is adopted whereby the existing watercourses are kept in such a condition that they can cope with as large a flood flow as possible. 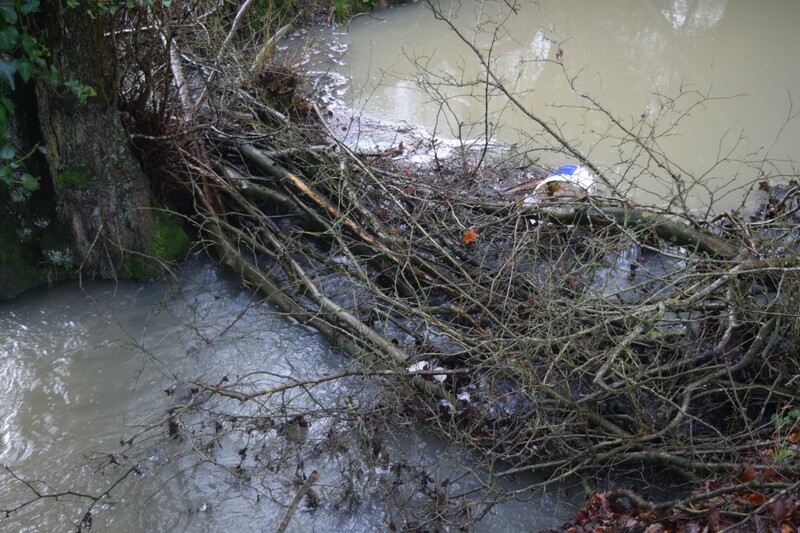 This means firstly keeping them clear of rubbish – both the stream beds and any associated culverts, drains and bridges. 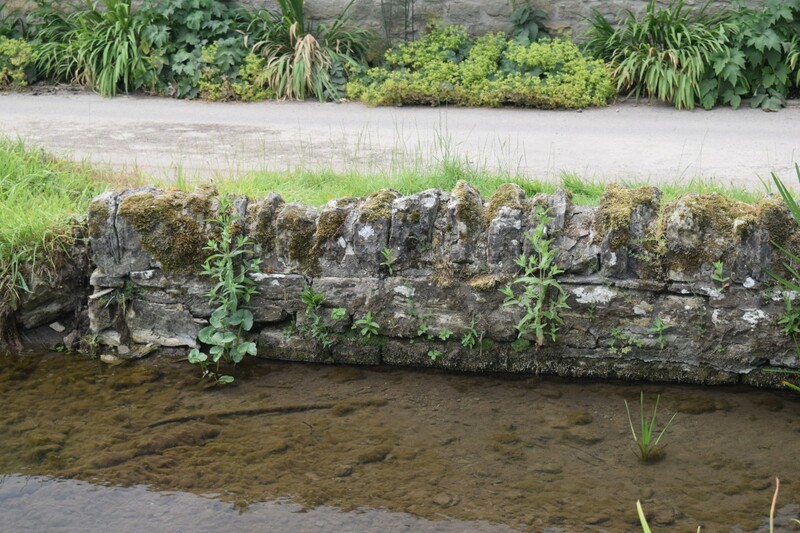 The stream beds and banks should be maintained by removing any build ups of silt in the beds and also taking back any banks encroaching into the stream bed – both by silt build up and excessive weed growth – so as to maintain the full stream width. Streams work best when they are straight so small kinks should if possible be straightened out. Such work will maximise the flow capacity of the watercourses. The FAG arranges regular working parties of volunteers to carry out all this maintenance work. If, despite all the above, water overspills stream banks and flooding results, the onus is on the property owners to protect their properties. The Shropshire Council will on request send out a survey team to assess your property and make recommendations on how best to protect it. 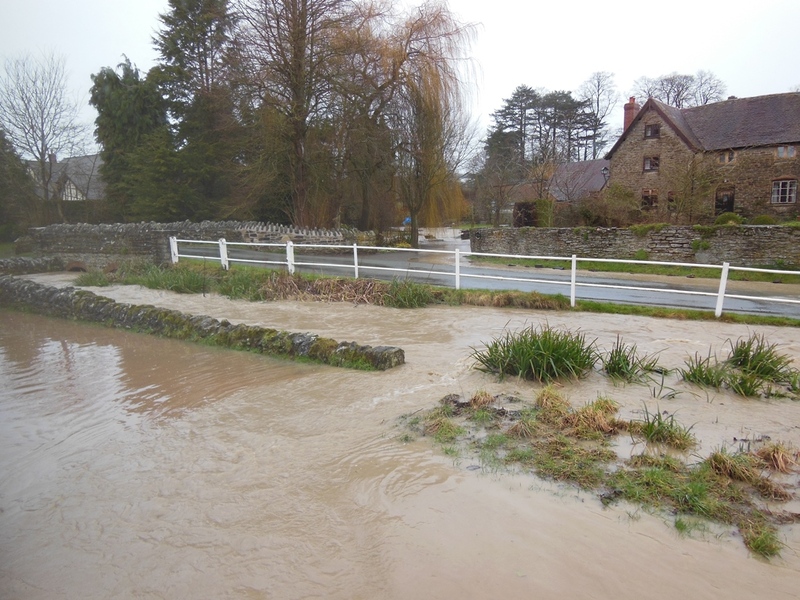 Grants are available for some items such as flood gates and waterproof rendering and sand bags are generally available locally on request to the Shropshire Council. 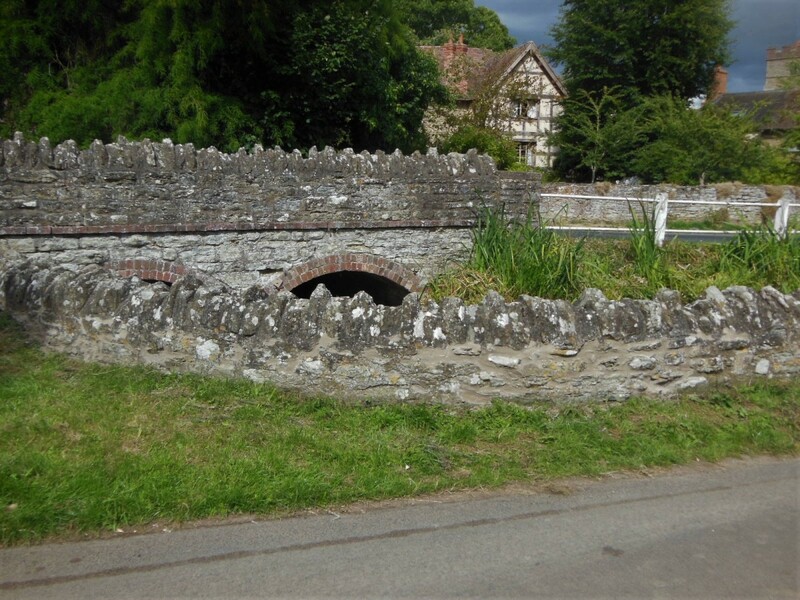 There are depth gauges installed on the Diddlebury and Culmington Bridges and when flow levels reach a pre - set alarm level, a message is sent out to the local FAG. 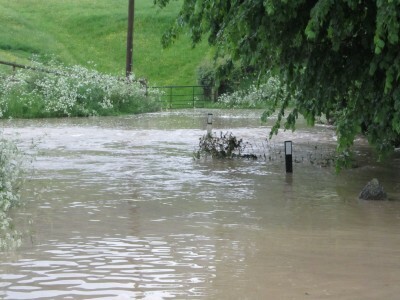 If the flow continues to rise and triggers a second higher alarm level (which has been set at a level known by experience to cause flooding), a further message is sent and the FAG can alert those vulnerable properties identified on their Flood Resilience Plan to give them time to erect their defences. If you live in a house that has previously flooded or that is shown to be within flood risk areas on the EA mapping, your Insurance Company may decline Cover or set a very high Premium. The Government has set up a flood insurance scheme called Flood Re which will offer reasonably priced cover to such properties. Details are available from the FAG. Without this support, we could not function. There exists an embryo Corvedale Forum which will eventually link up all the existing and future FAG’s in the Corvedale to enable them to share common problems and solutions. We maintain a Flood Action Plan which is kept up to date and which forms the Agenda for our regular Multi Agency Meetings. 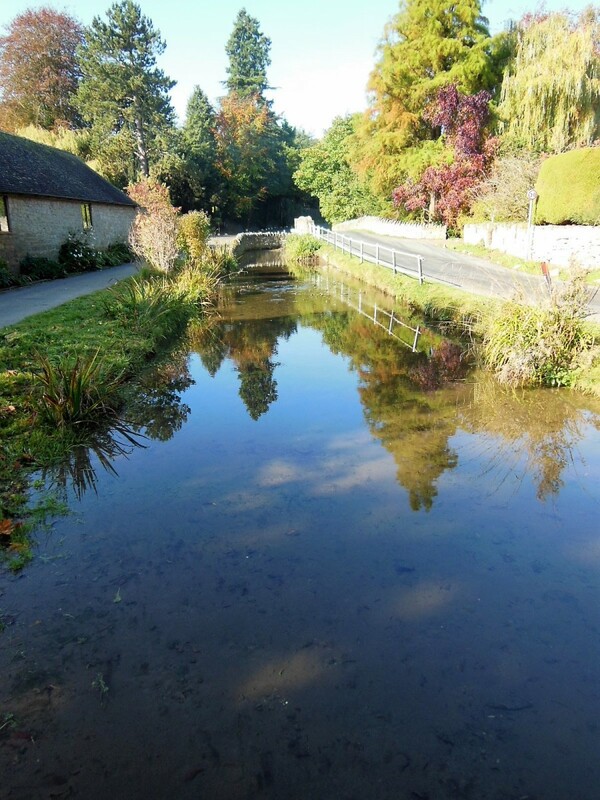 With the kind assistance of the Diddlebury Parish Council, we vet all incoming Planning Applications in regard to flooding issues. This is kept up to date with news on events, progress reports, requests for volunteers and so on. There are also frequent articles in the Corvedale News. I can be contacted at: gneden@googlemail.com. As we have been lucky enough to have had a dry period with no flood events, I thought I should just remind us all of what a flood event looks like. The following images are from 2007, 2008 and 2012. 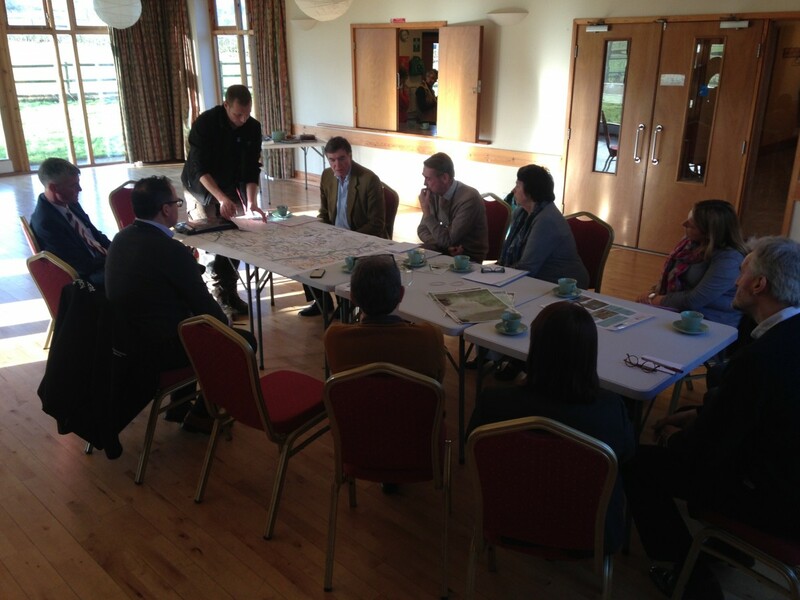 Around 60 people attended the meeting including many members of the local farming community. Andrew Osbaldison – catchment co-ordinator, Environment Agency - spoke first. He went through the new Farming Rules for Water which come into force on 2nd April. Afterwards, Andrew answered several questions from the floor. 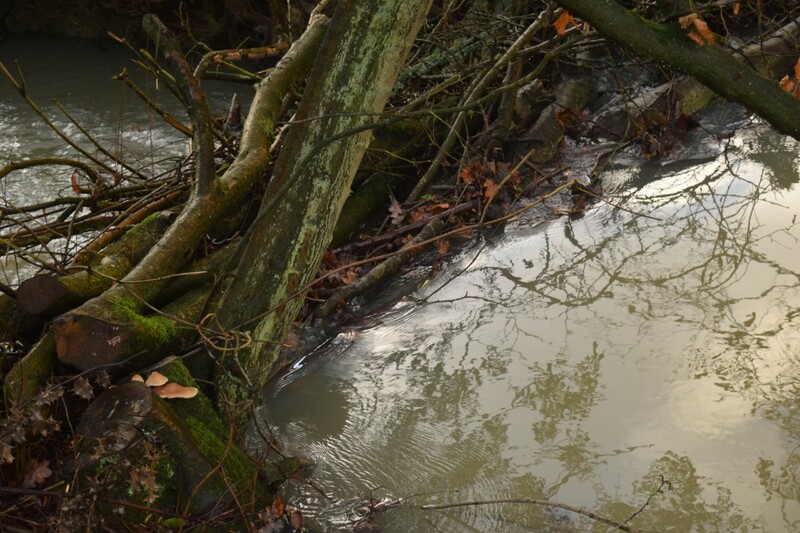 Luke Neal – River Officer, Shropshire Wildlife Trust – then gave an overview of how Natural Flood Management, of which Slow the Flow is one important part, works and how effective it can be. He then gave an update on his present project in the Corvedale. 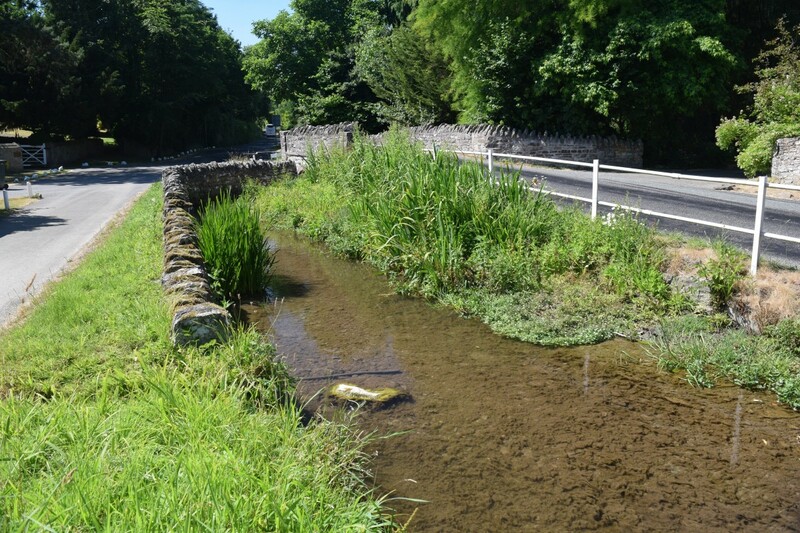 Many leaky dams have already been installed in the Seifton Brook above Culmington and about 130 in the stream below Wilderhope Manor. 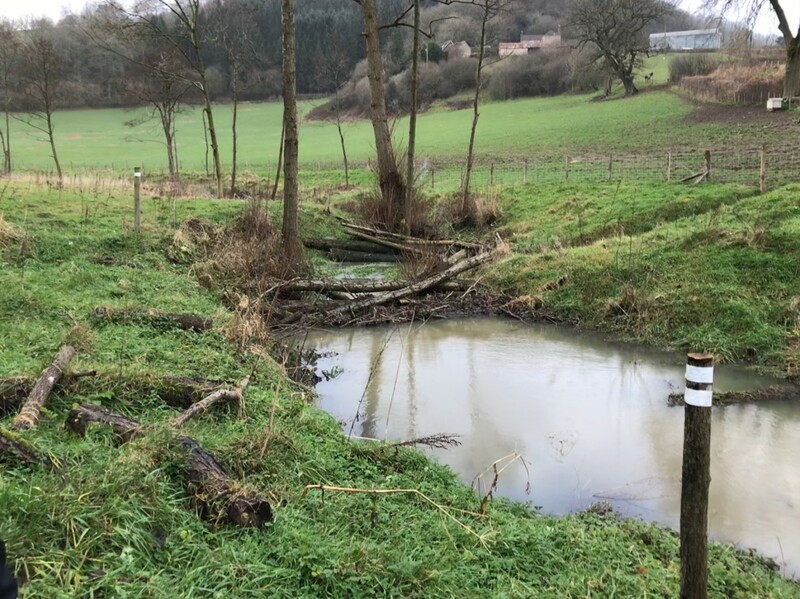 Work starts on 21st February on the installation of 50 leaky dams in the Diddle Brook catchment above Diddlebury with the kind permission of Delbury Estates. Luke took several interesting questions from the floor and then showed an excerpt from the film “High Water Common Ground” which looks at Slow the Flow in practice around the Country and which included some clips about Culmington and Diddlebury. I will provide further updates from time to time on the Corvedale Project. 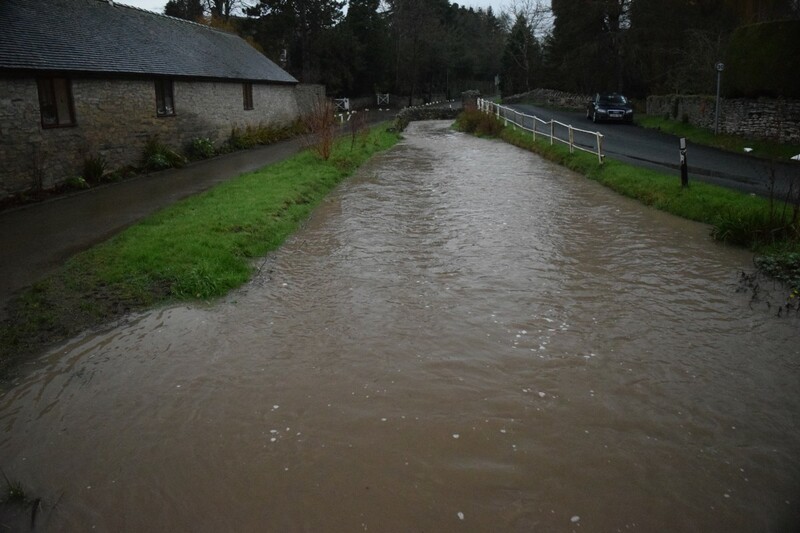 The following images were taken at the recent meeting at Culmington Village Hall and subsequently at WestHope on the Seifton Bache when our local MP - Mr Philip Dunne, came to be briefed about the Slow the Flow concept and see it in action. He subsequently wrote an Article on this topic which can be seen on the following link. 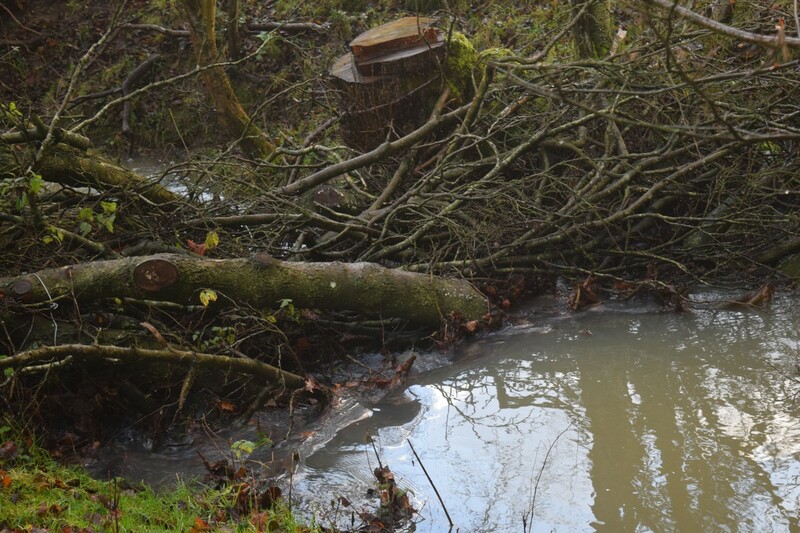 The good news is that an Agreement has been reached with the local landowners which will allow a start on the construction of over 50 leaky dams in the Diddle Brook catchment in February. Geoff attended a meeting held in Culmington on 26th January at which Mr Philip Dunne MP was briefed on the progress of the Slow the Flow project throughout the Corvedale. 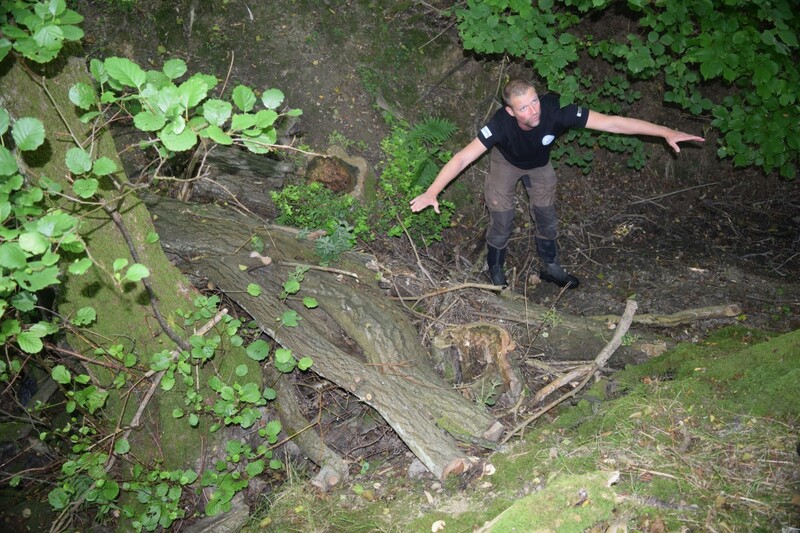 This was followed by a site inspection of the leaky dams already built in the Seifton Brook catchment. These have already worked well during recent rains. Mr Dunne was also acquainted with our concerns over the EA’s proposed large increases in the cost of Consents to any works in Rivers. These increases of over 4 times the present costs would price small volunteer groups such as ours out of existence. He will take this up with the relevant Minister. At the same meeting, representatives from the EA confirmed that they were aware of these concerns, which had been expressed by many other similar groups and that they would be addressed now that the Consultation period was over. 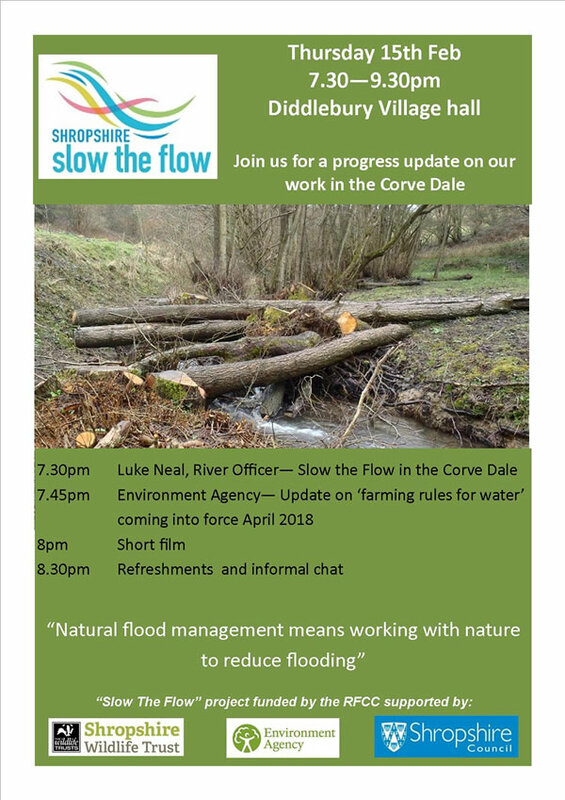 There will be a public Meeting at the Diddlebury Village Hall at 7.30pm on Thursday 15th February at which Luke Neal of the Shropshire Wildlife Trust will present an update on the Slow the Flow project in the Corvedale. This is probably the largest scheme of its kind in the UK. 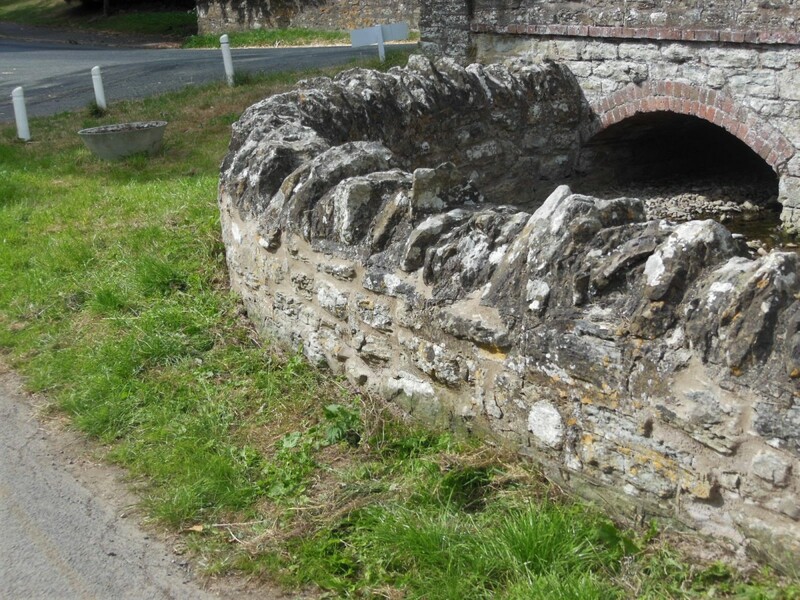 The Parish Council now kindly send all Planning Applications to the Group for comment on the drainage aspects. 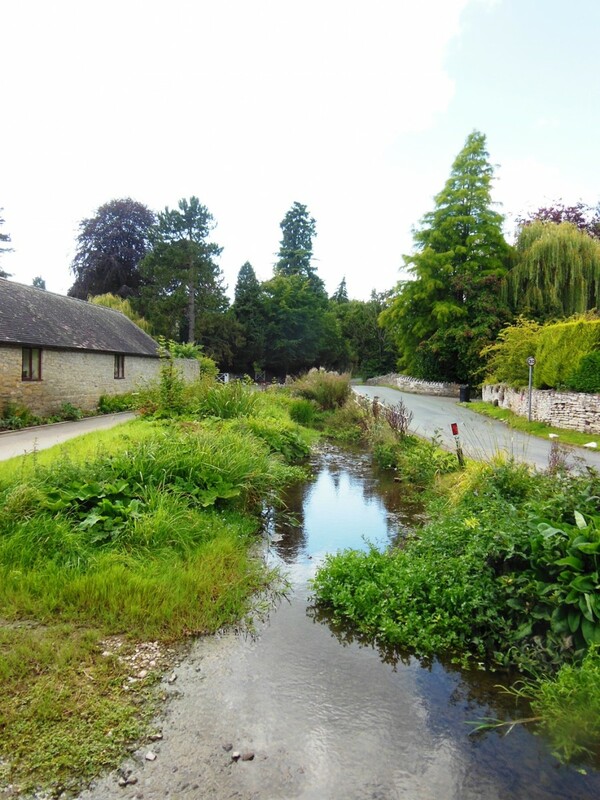 The Environment Agency will be giving information to landowners and farmers about the next round of regulations and funding available at 7.00pm in the Craven Arms Community Centre.